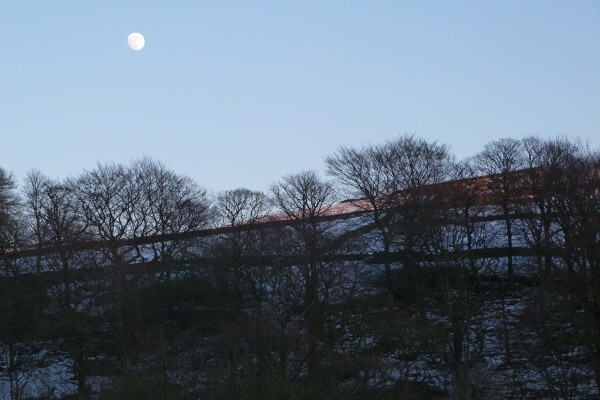 Pecket Well is a small village up on ‘the tops’ above Hebden Bridge on the road over to Haworth. 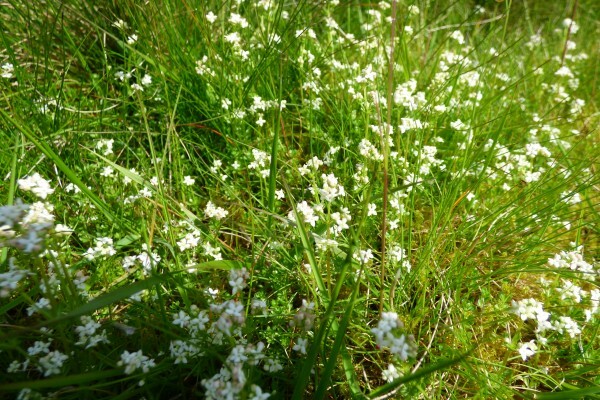 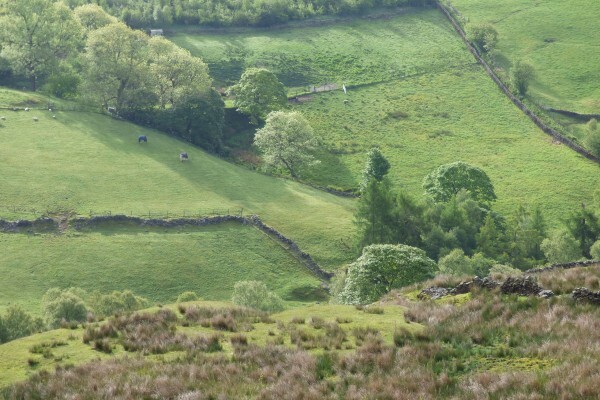 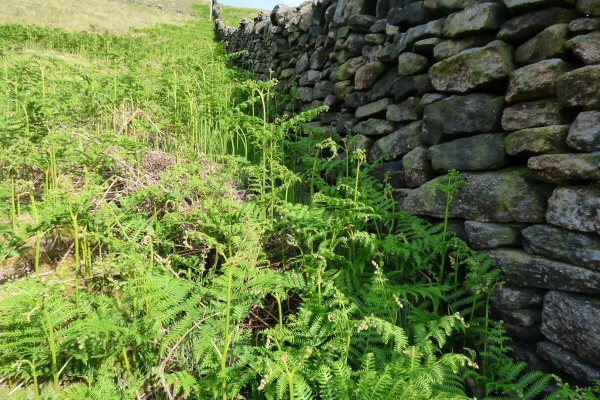 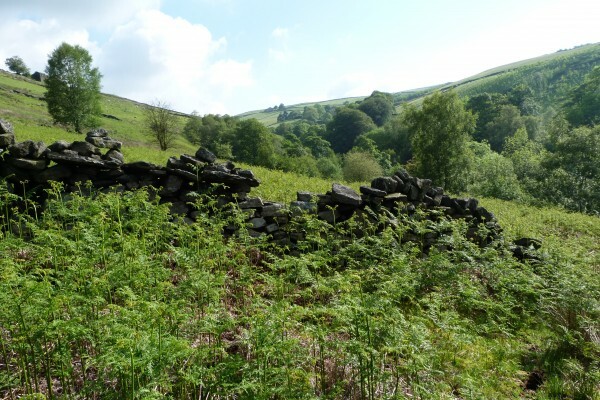 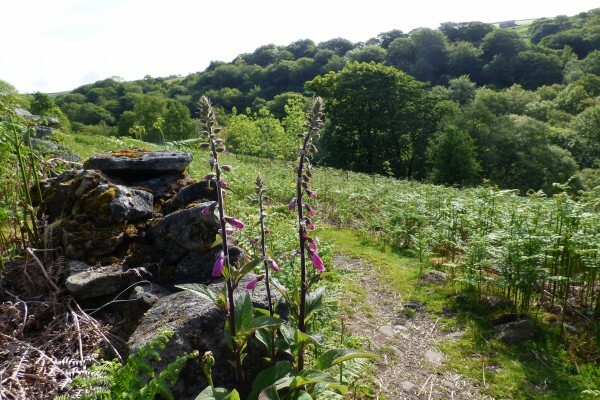 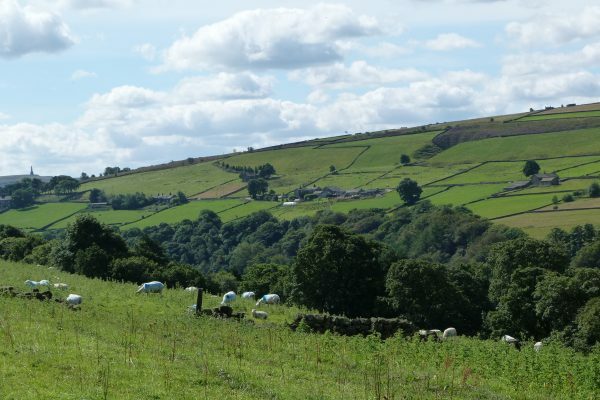 After a steep two-mile climb up through the woods you emerge into lush green hay meadows on the shoulders of the hills above Hardcastle Crags. 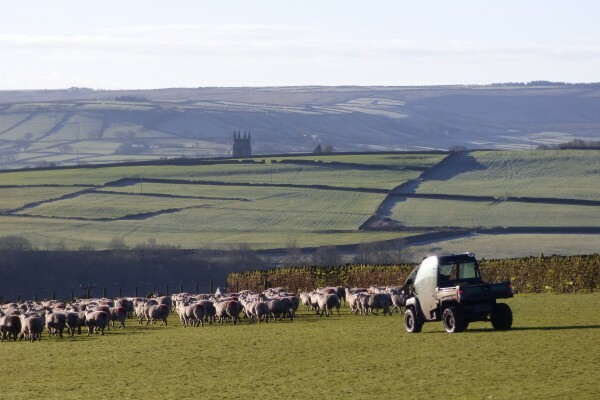 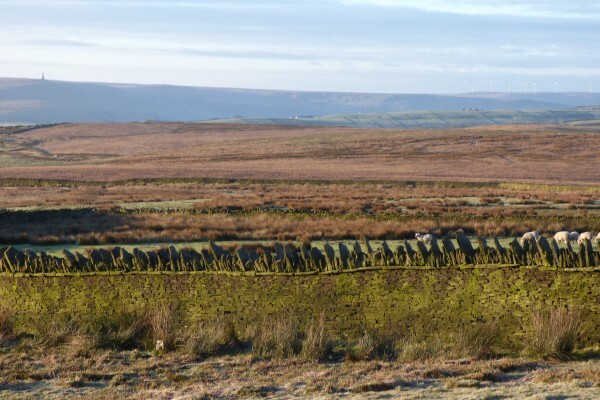 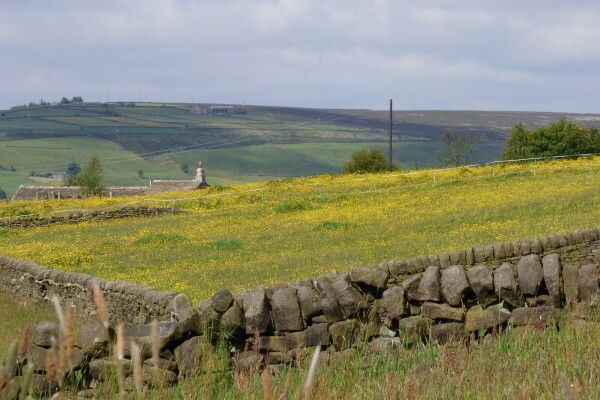 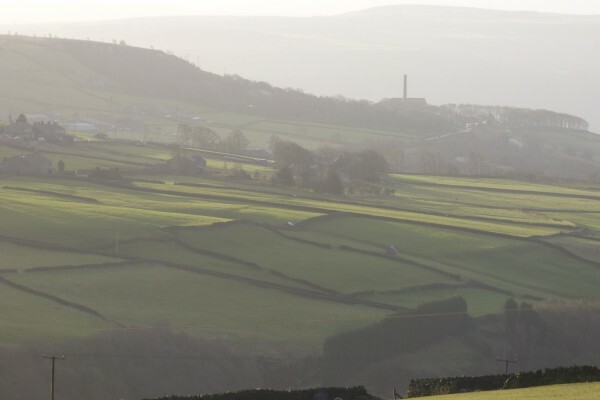 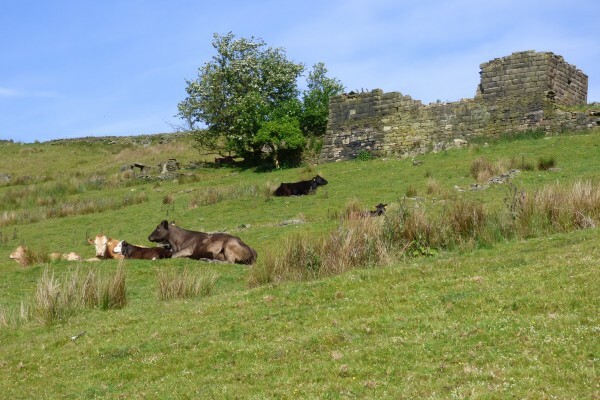 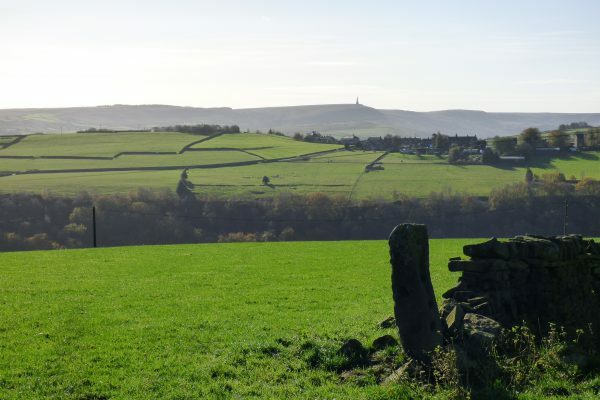 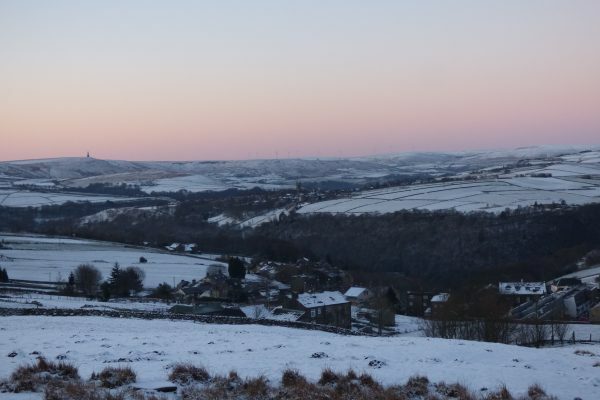 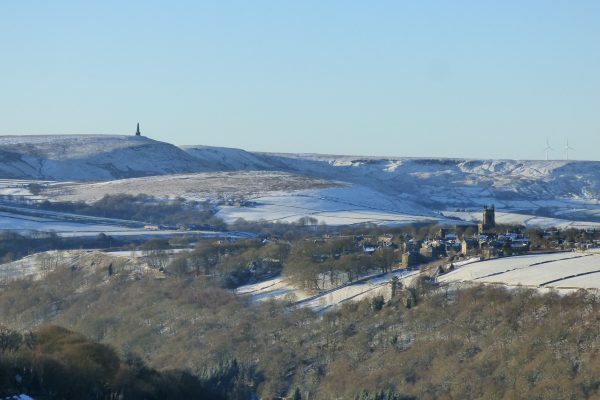 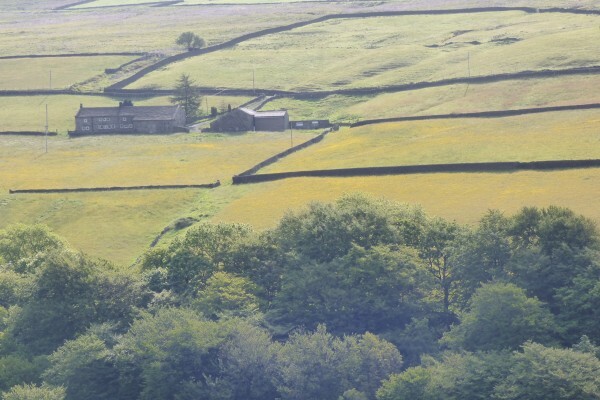 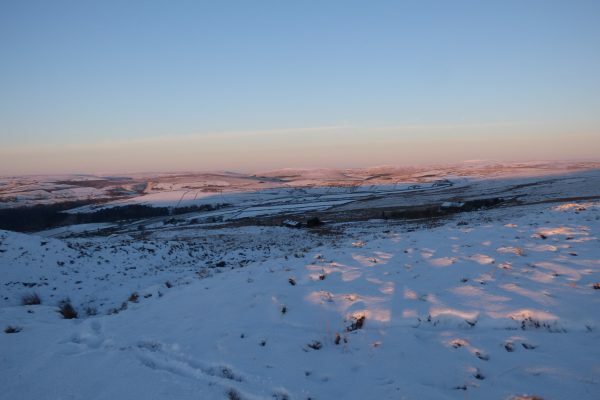 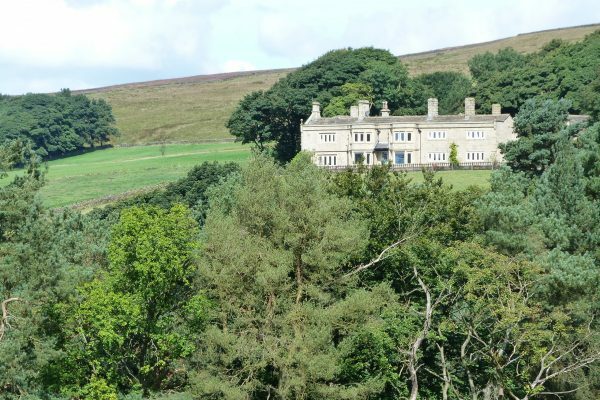 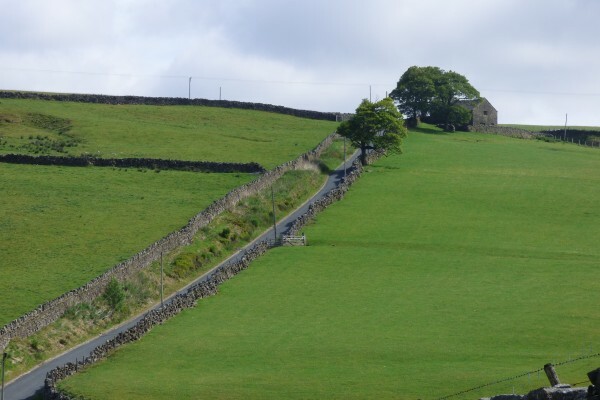 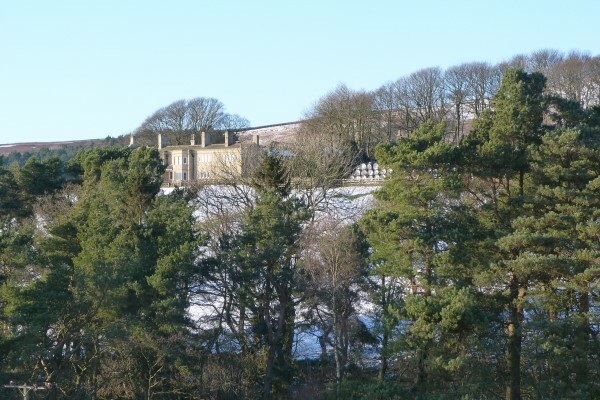 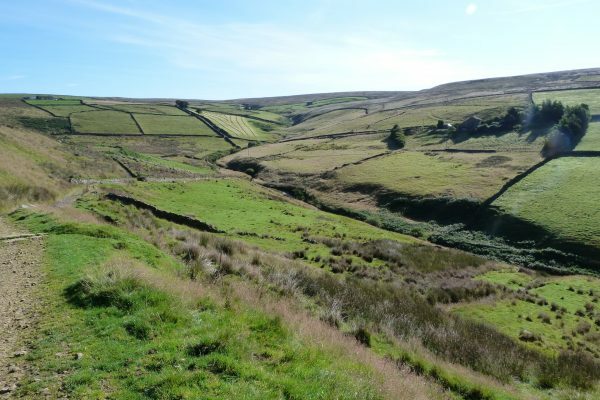 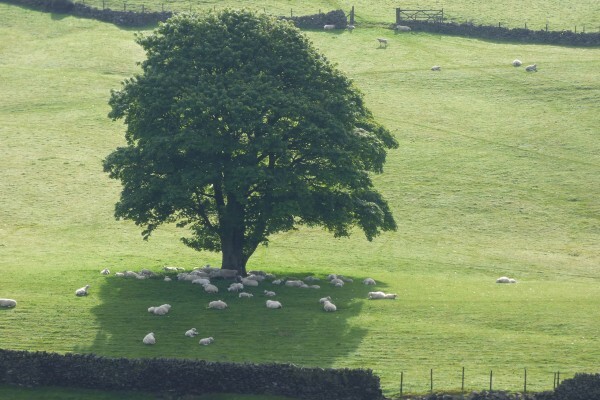 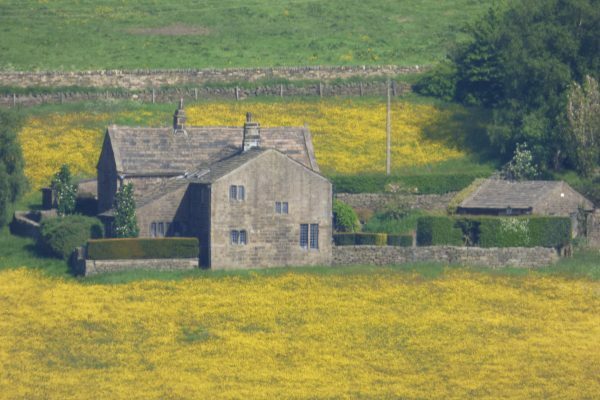 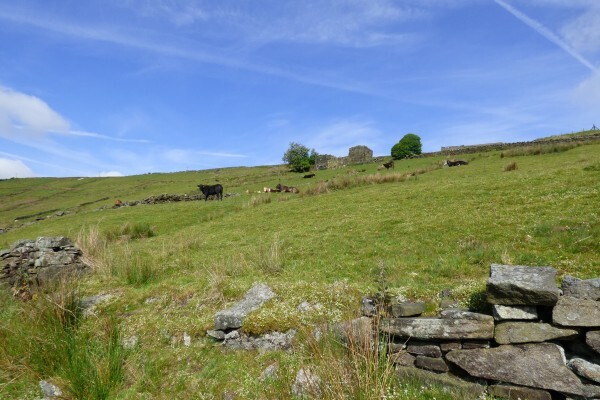 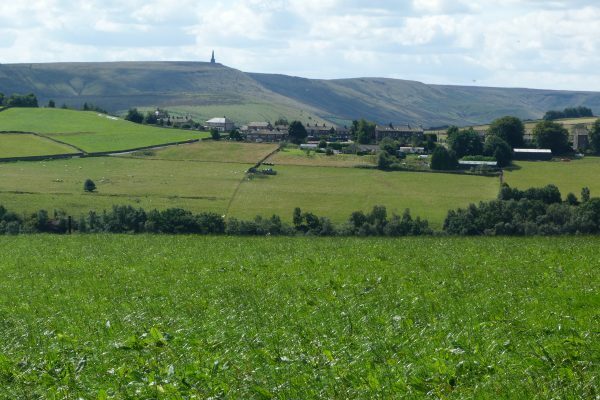 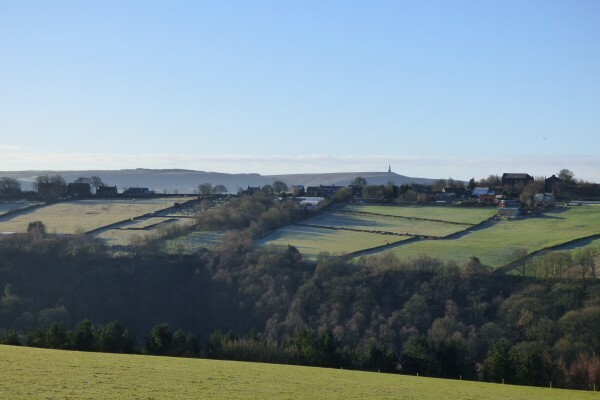 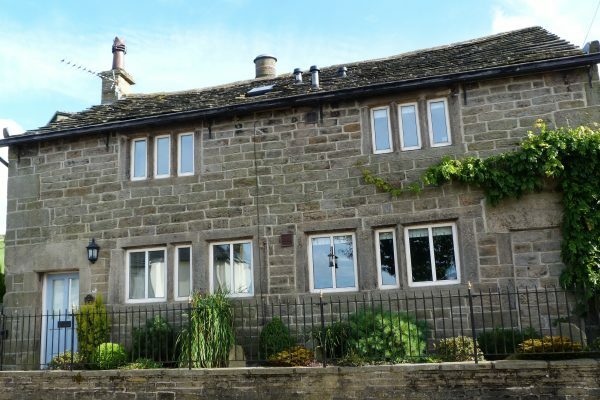 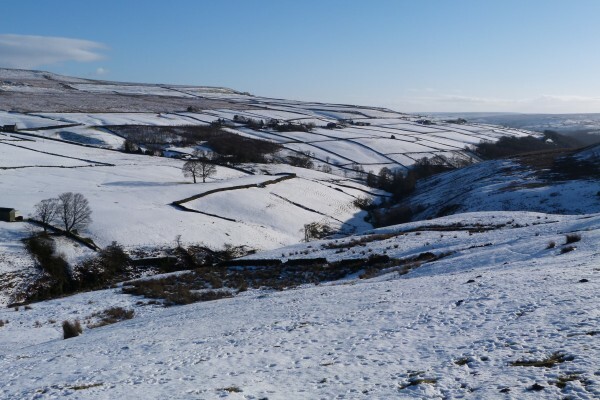 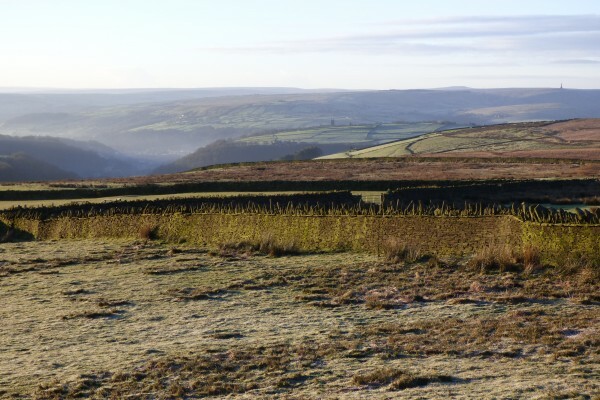 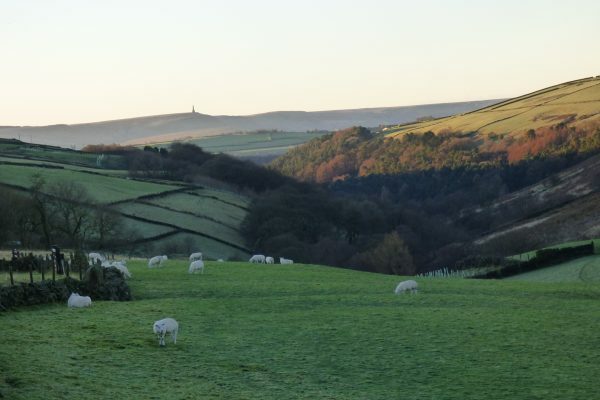 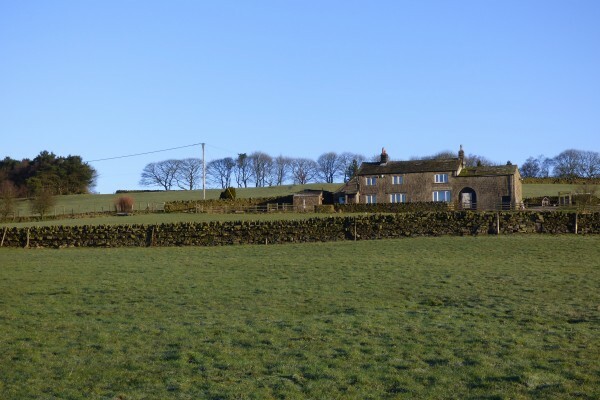 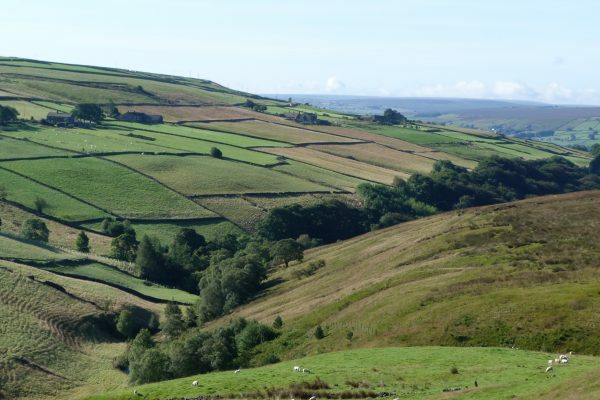 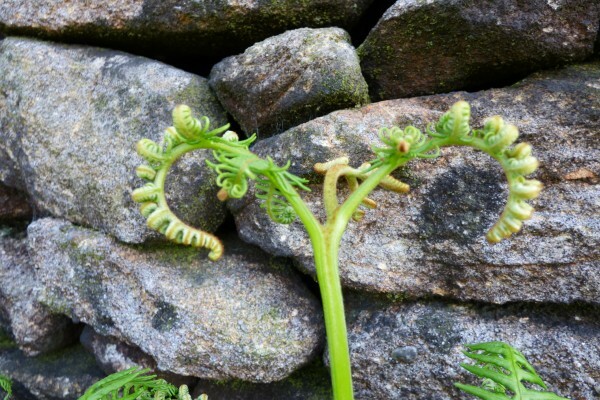 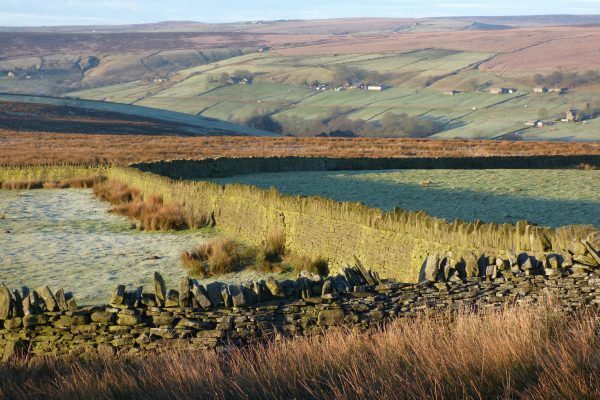 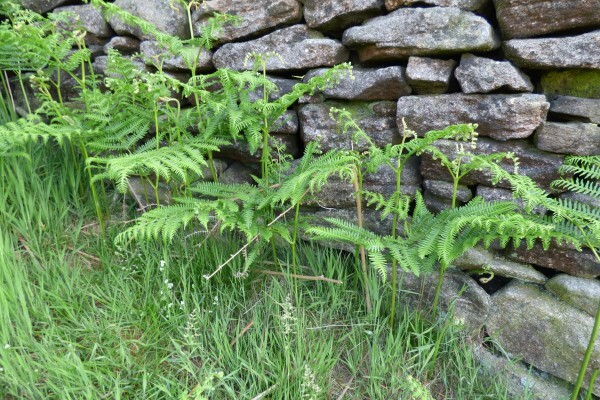 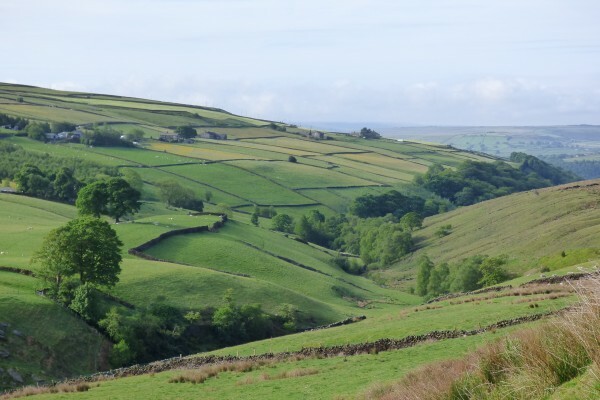 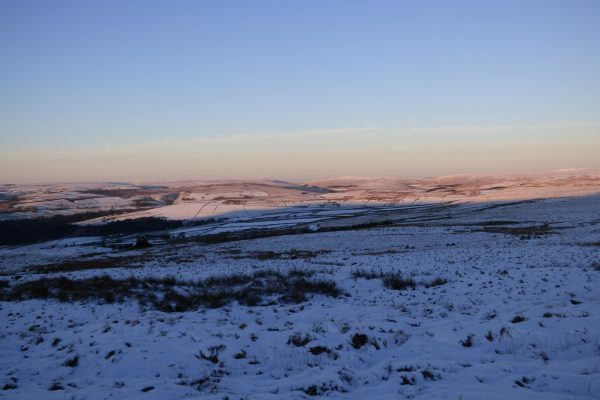 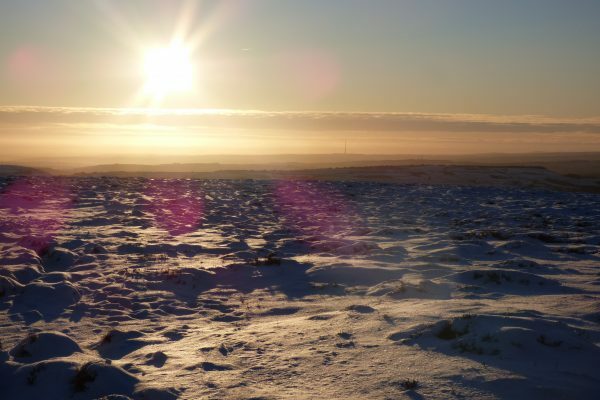 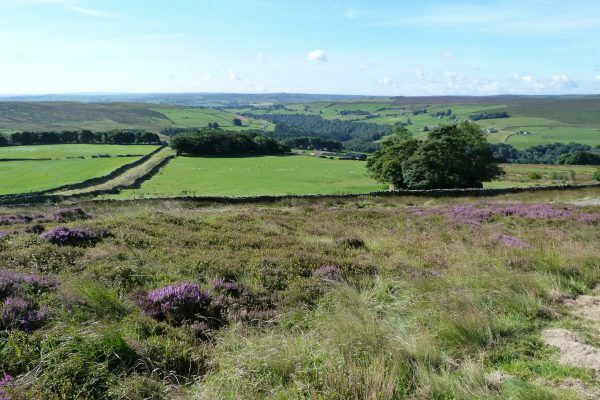 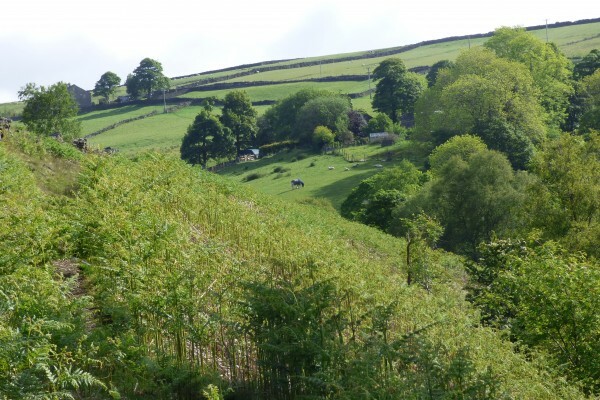 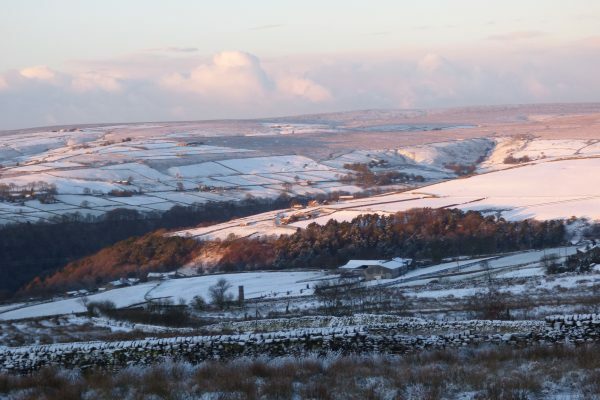 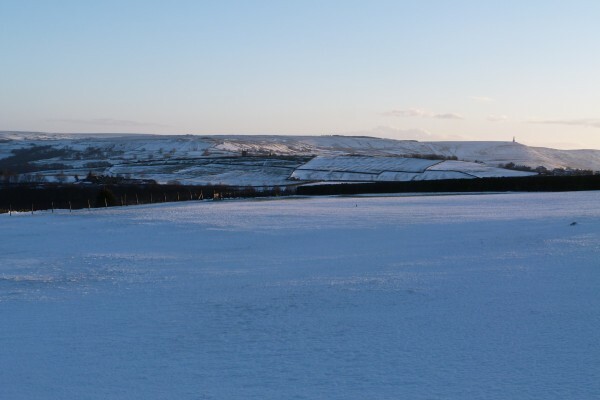 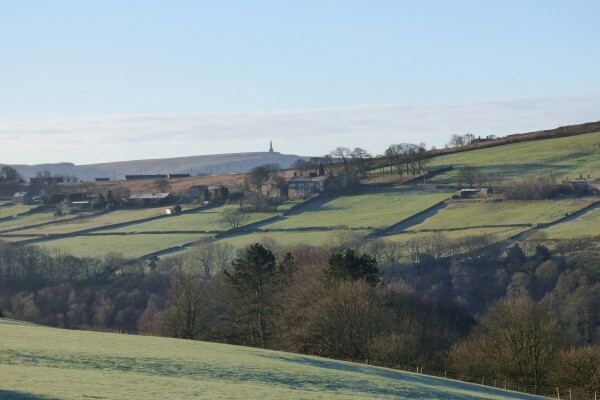 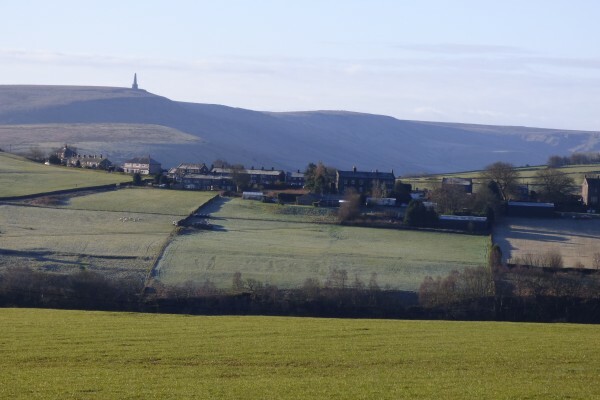 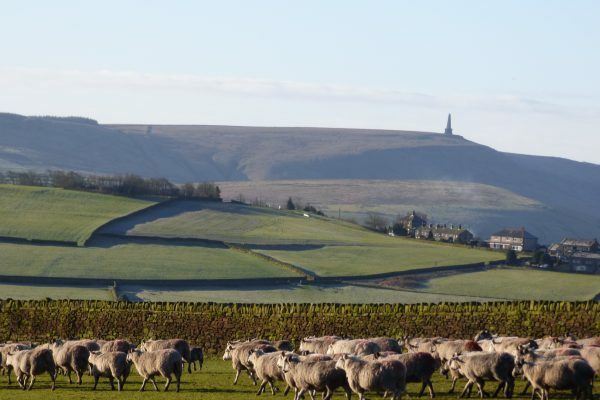 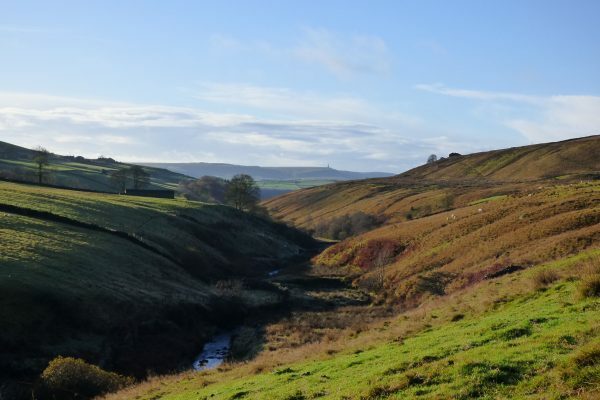 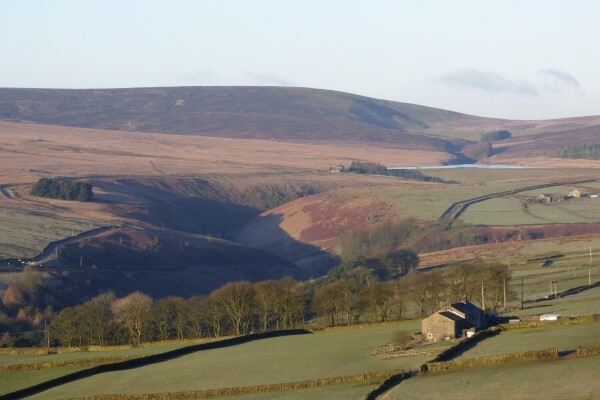 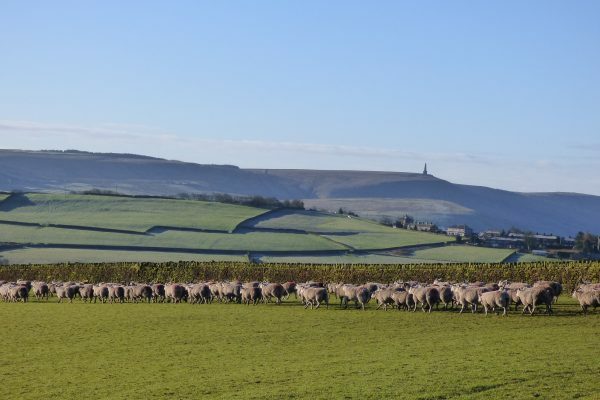 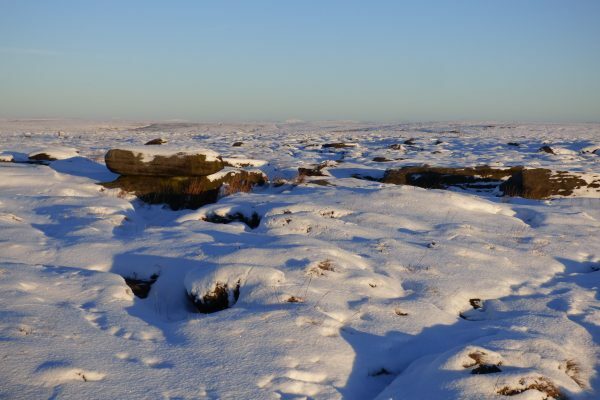 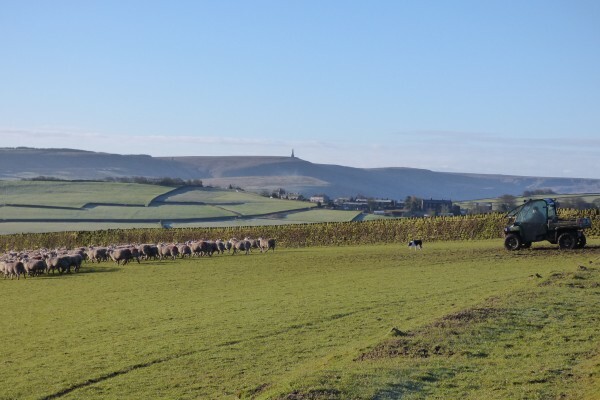 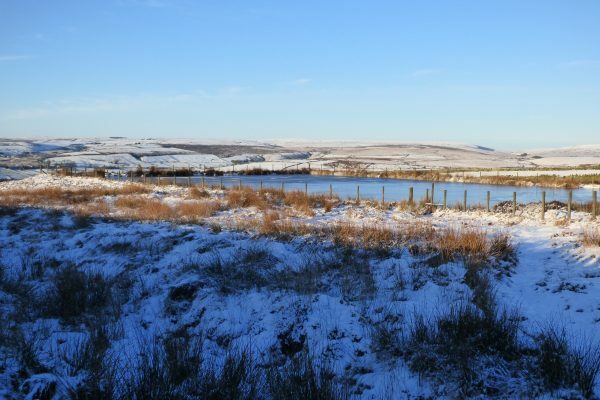 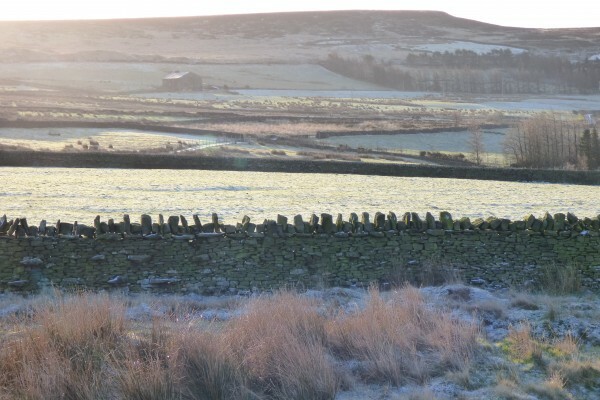 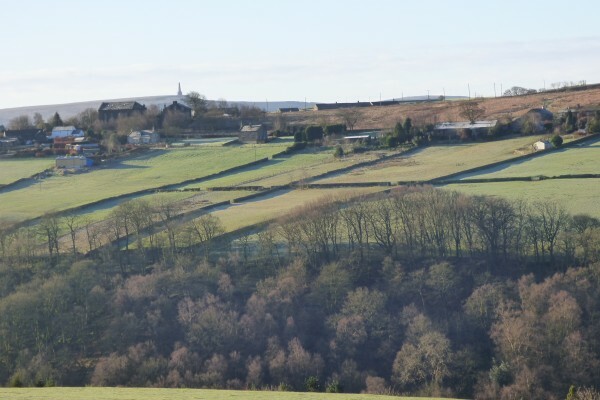 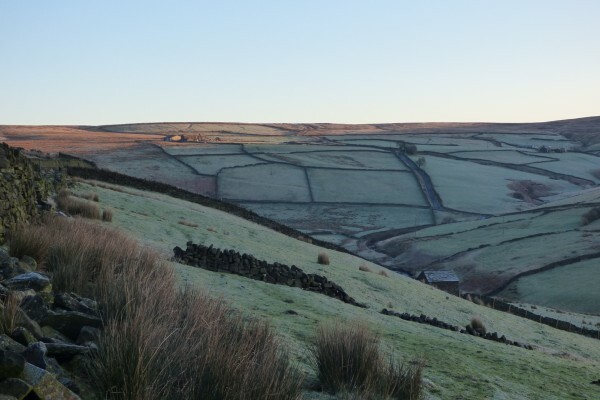 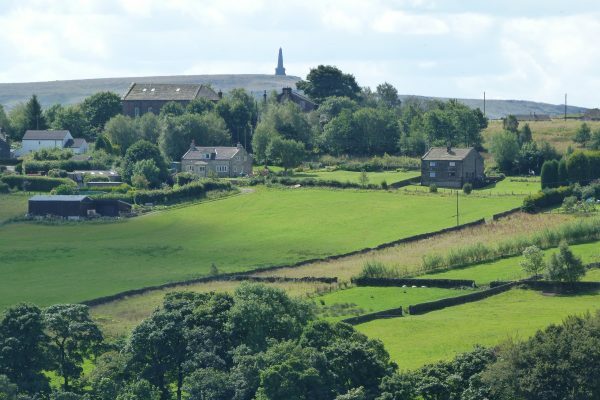 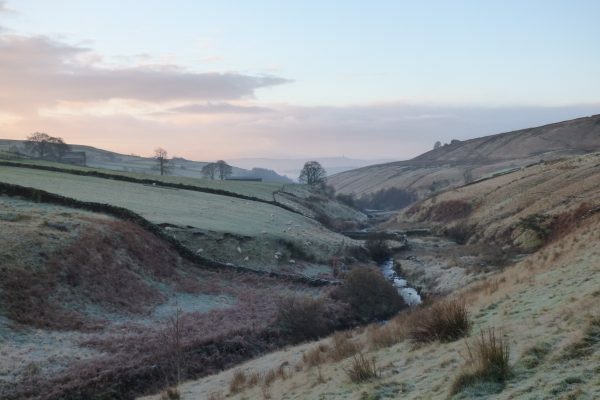 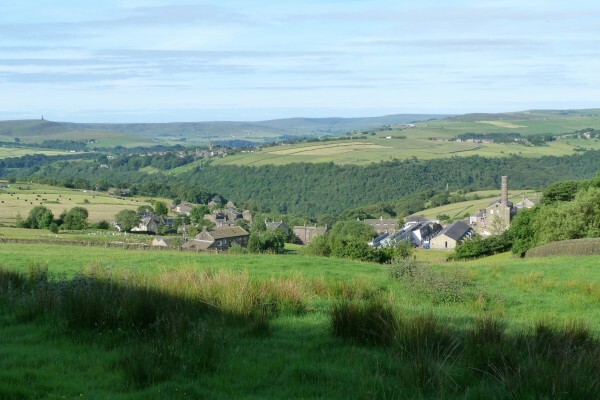 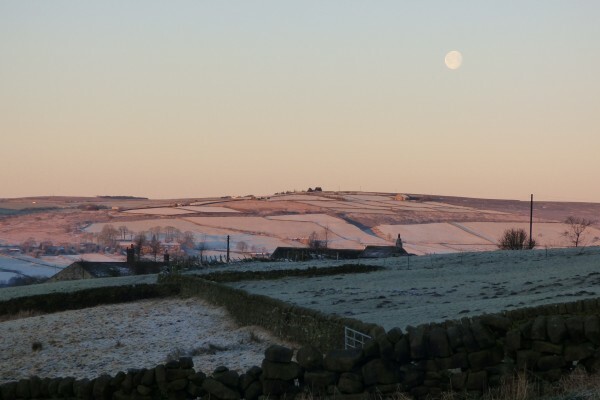 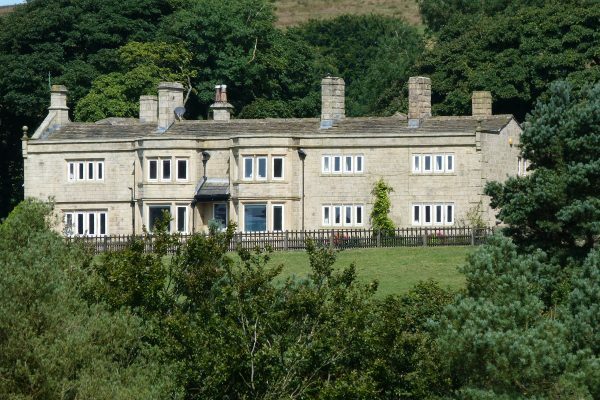 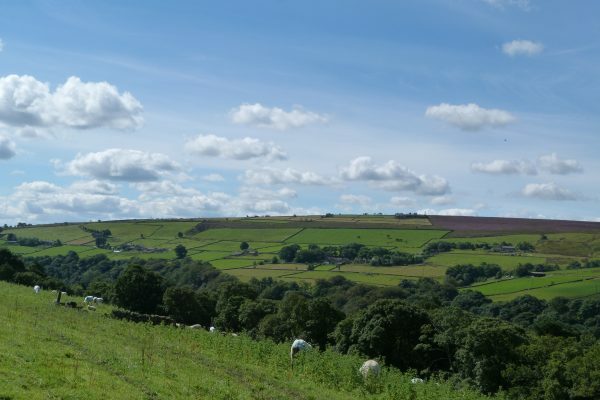 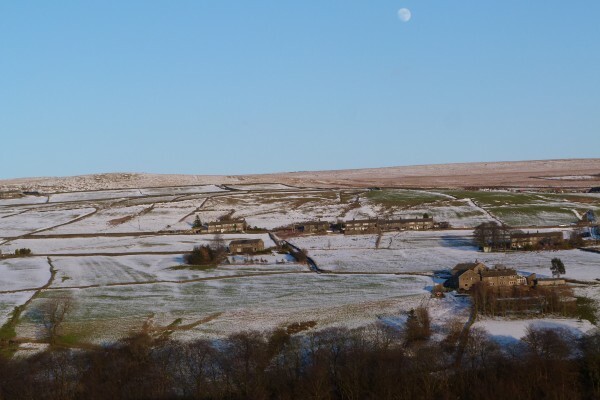 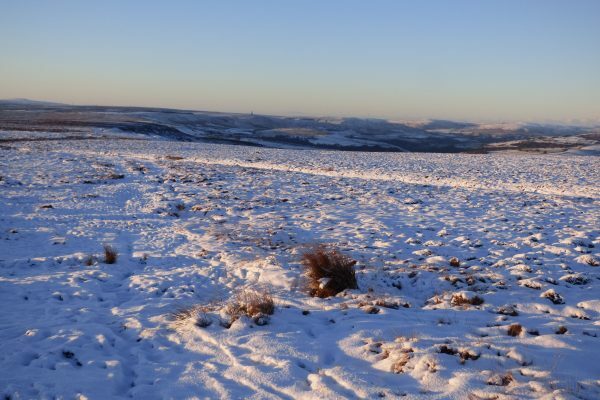 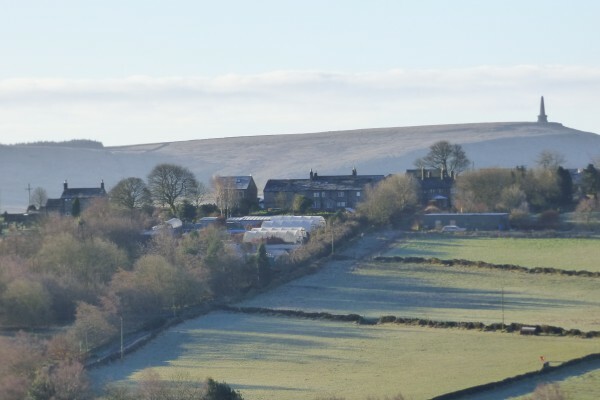 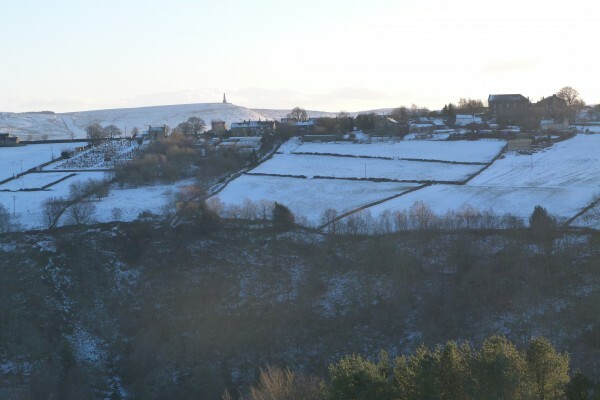 Surrounded by fields, Elmet Farmhouse is in a prime position in the centre of Pecket Well, with breathtaking views towards the ancient village of Heptonstall on the opposite hillside, with the imposing monument of Stoodley Pike on the horizon in the distance. 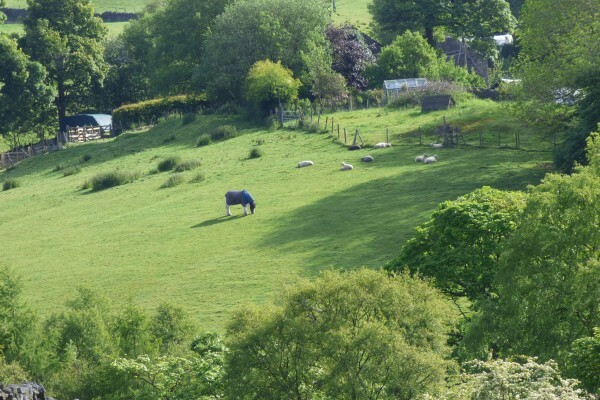 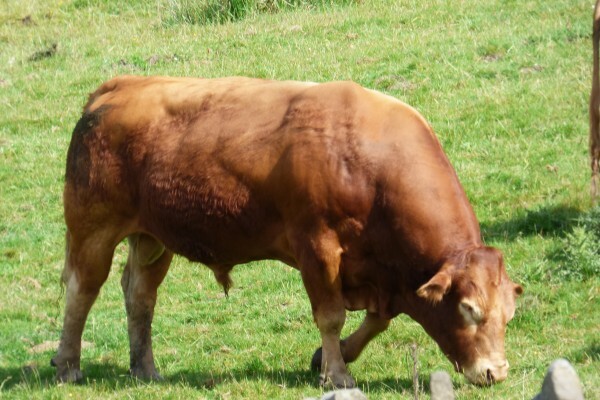 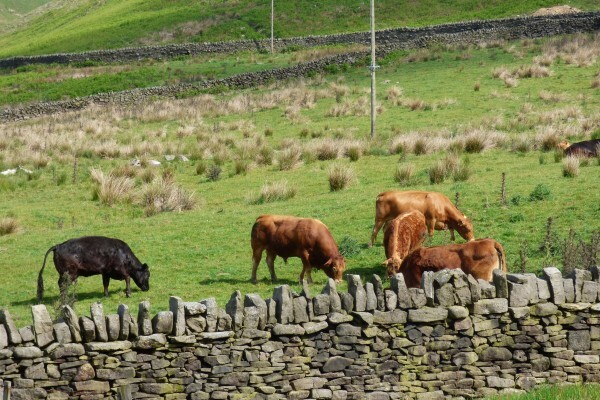 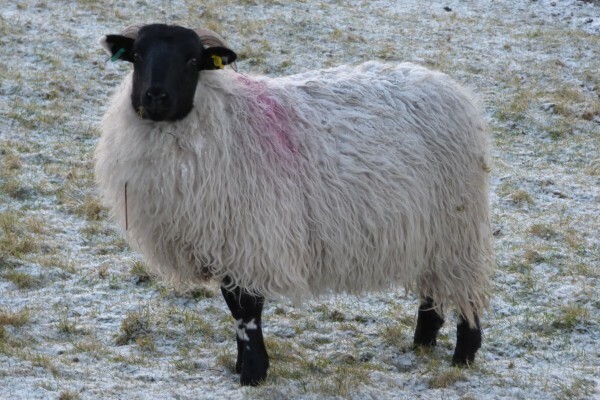 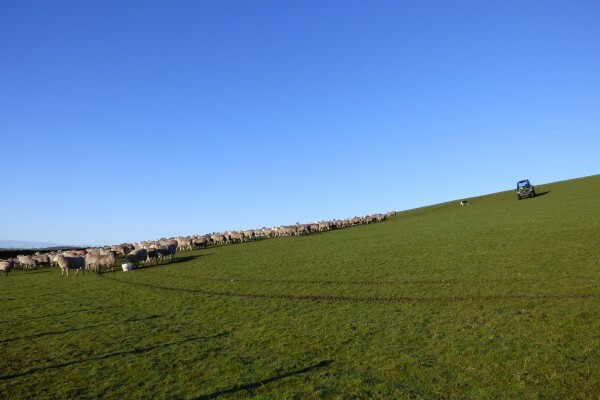 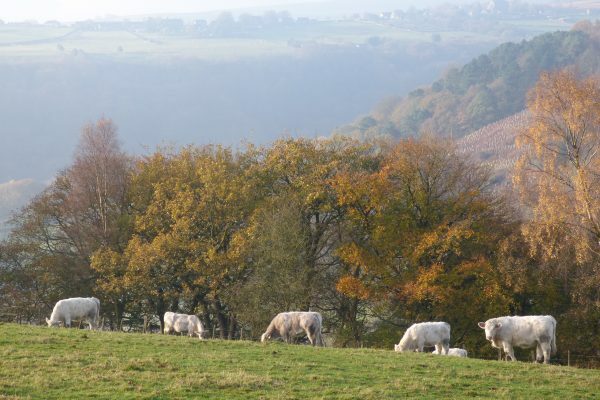 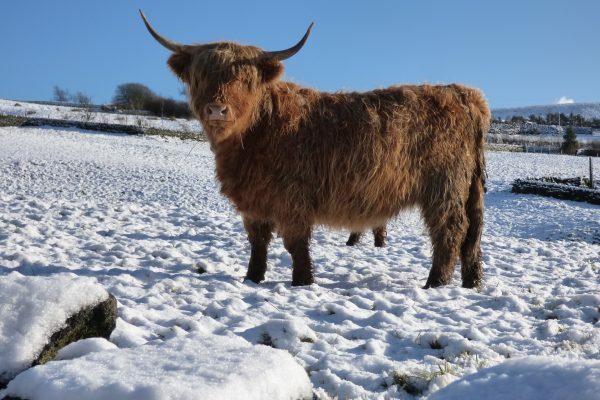 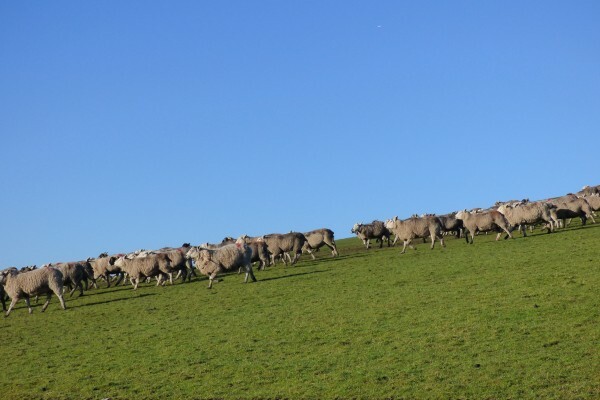 Grazing in the fields around Pecket Well are sheep, horses and Highland cattle. 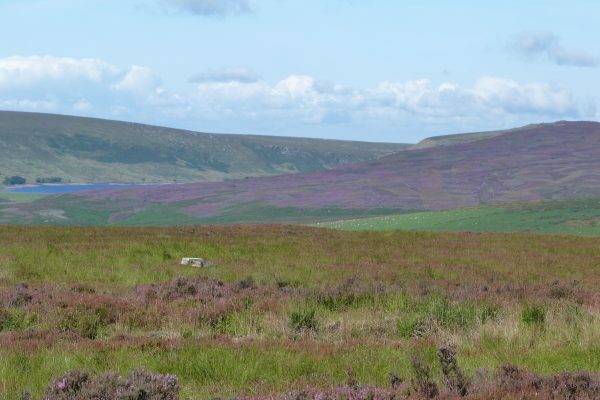 Higher up above the meadows on the top of the hills are vast expanses of heather moorland. 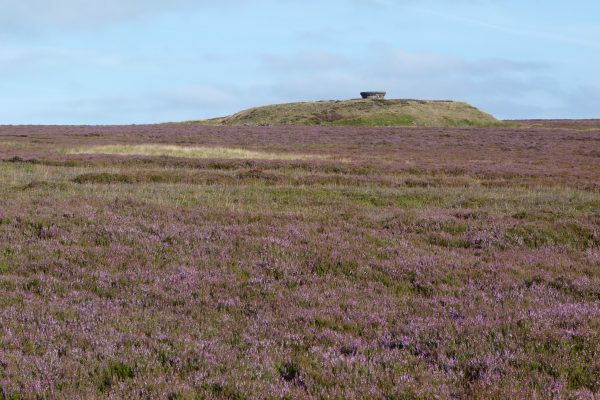 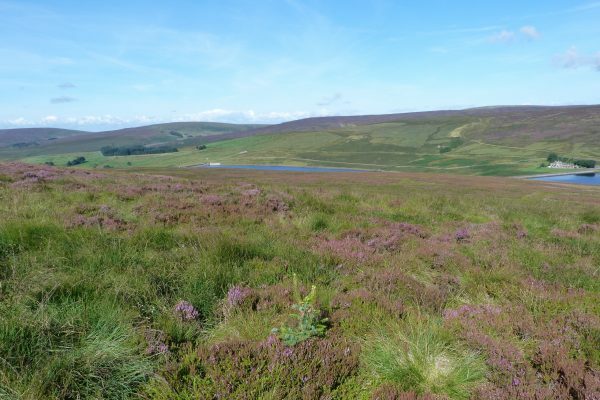 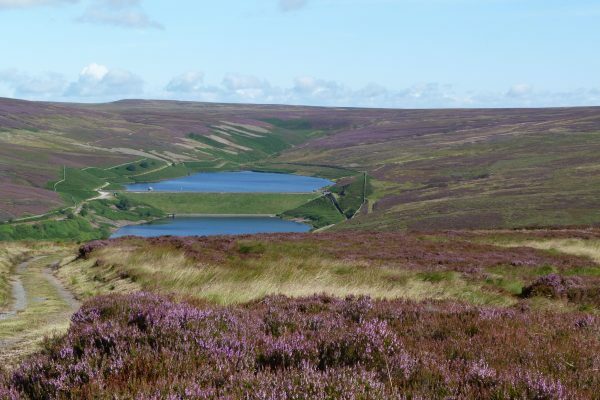 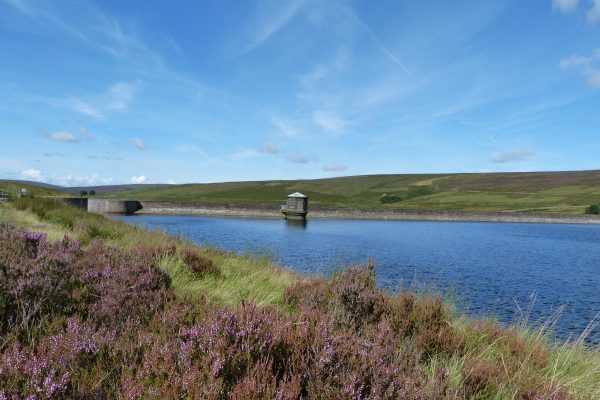 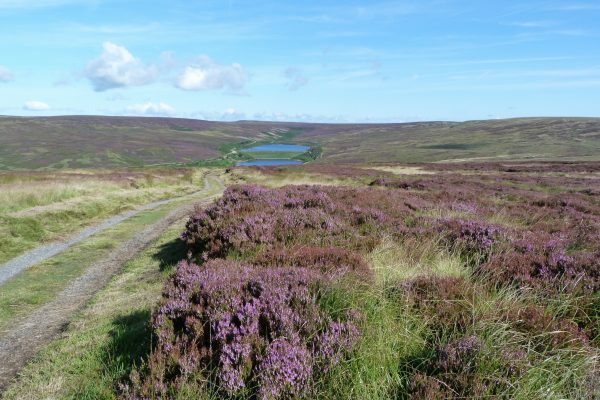 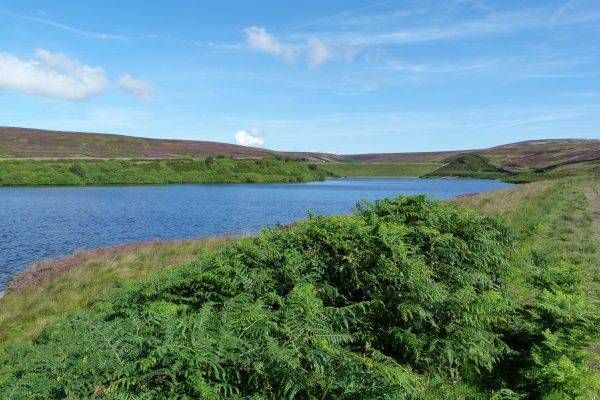 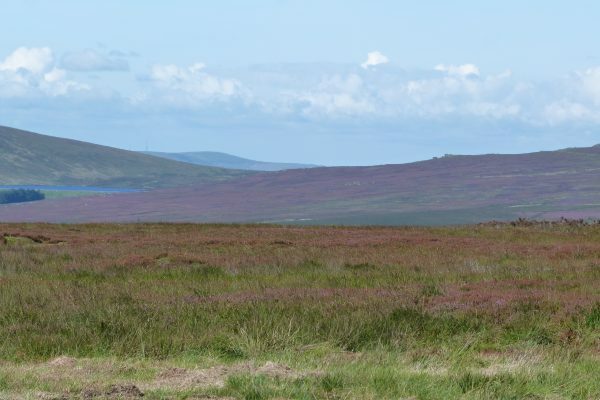 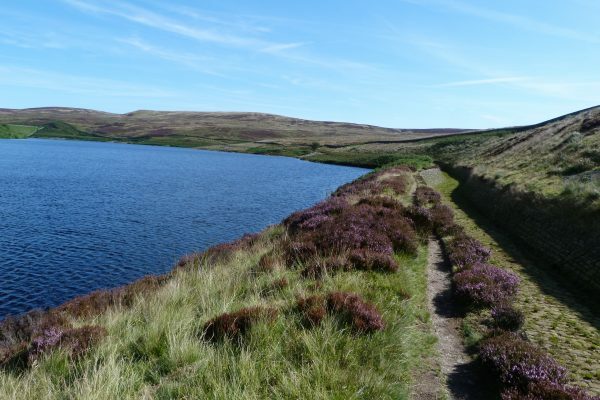 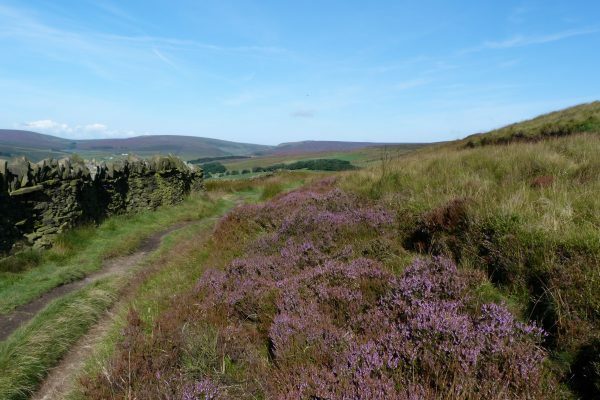 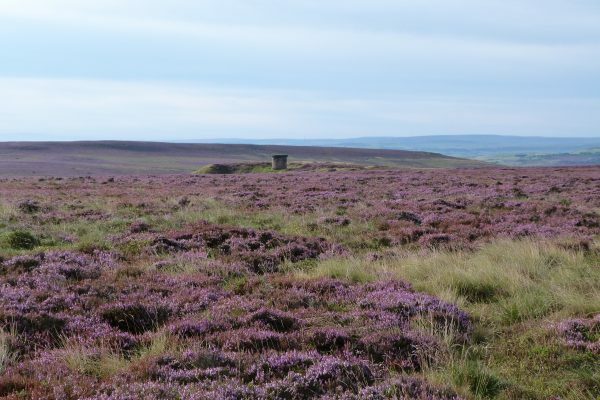 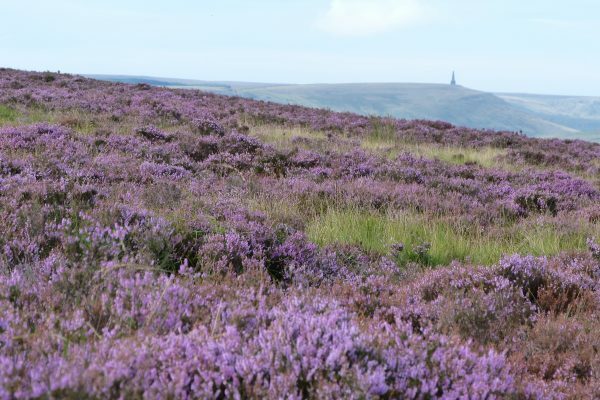 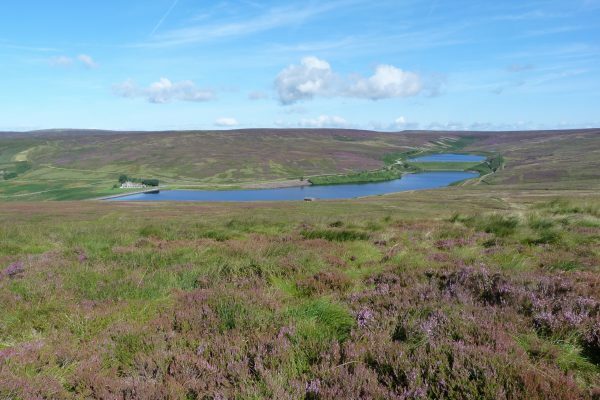 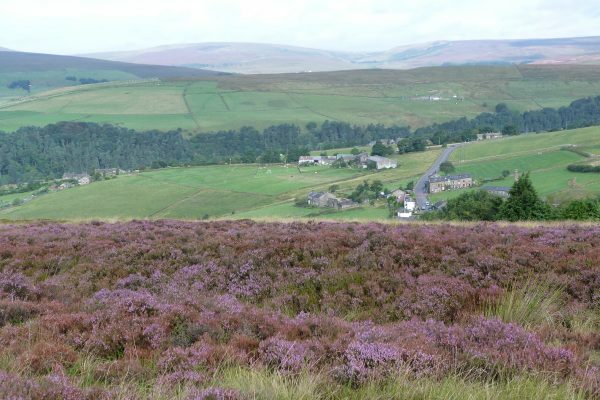 A haze of purple in August when the heather is in full bloom, Wadsworth Moor is a marvellous place for bird-watching. 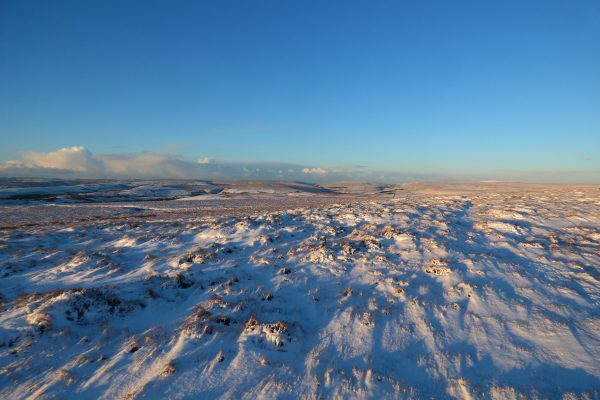 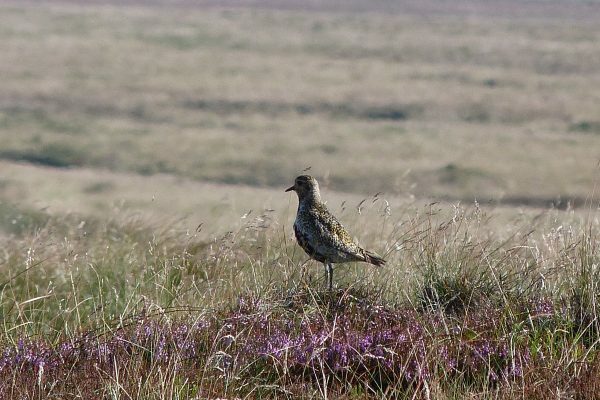 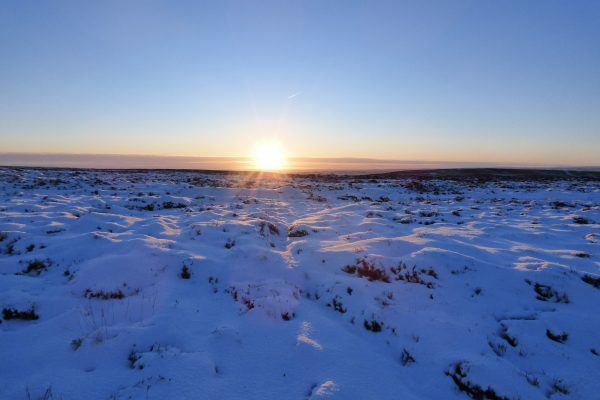 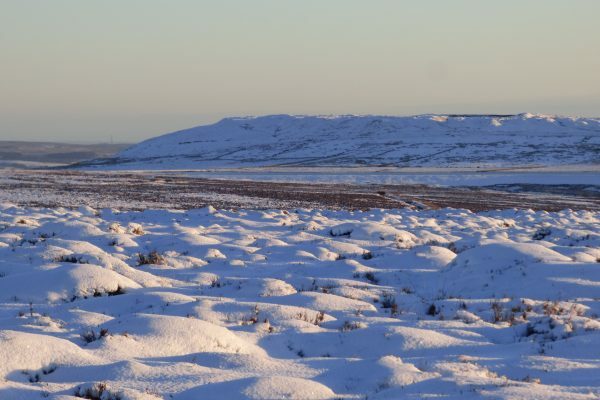 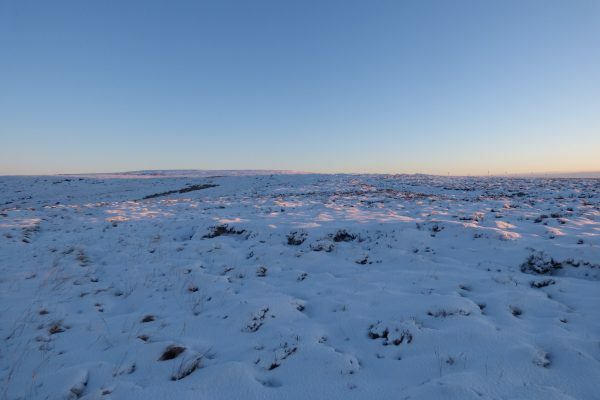 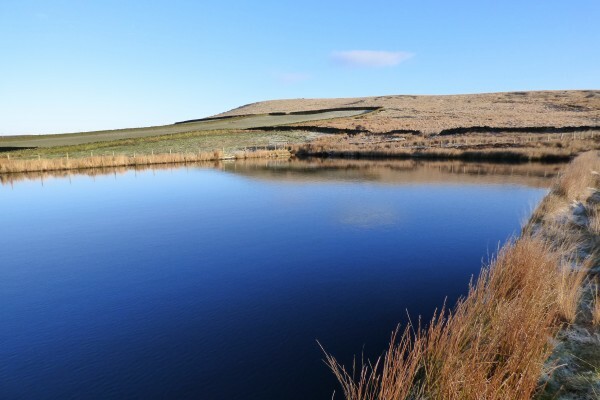 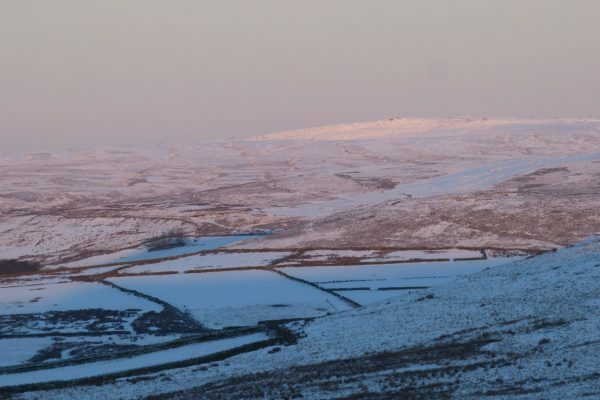 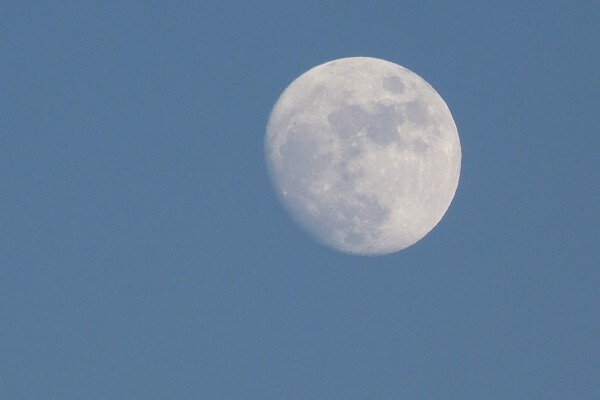 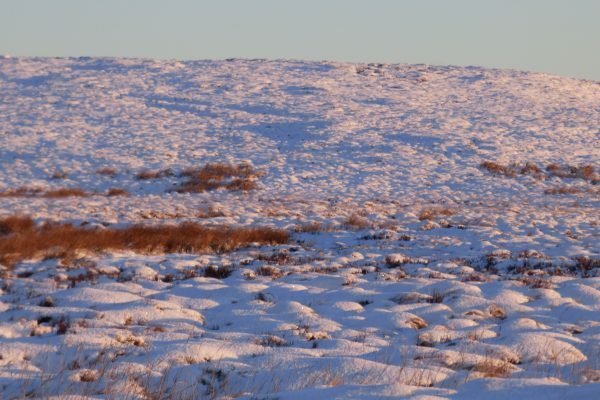 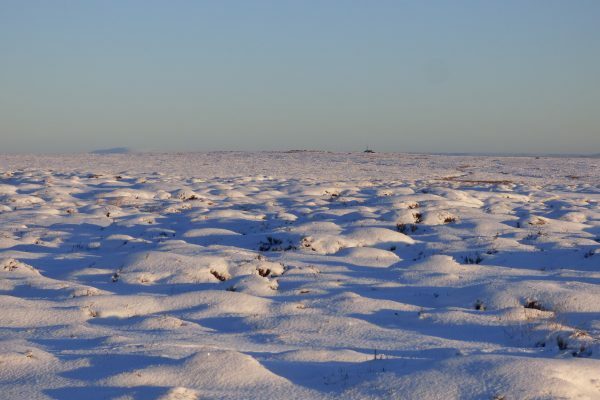 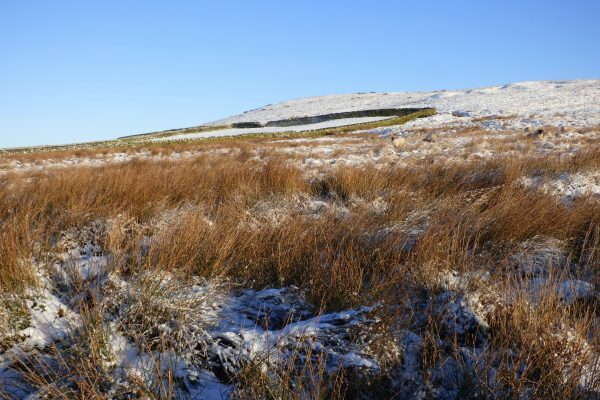 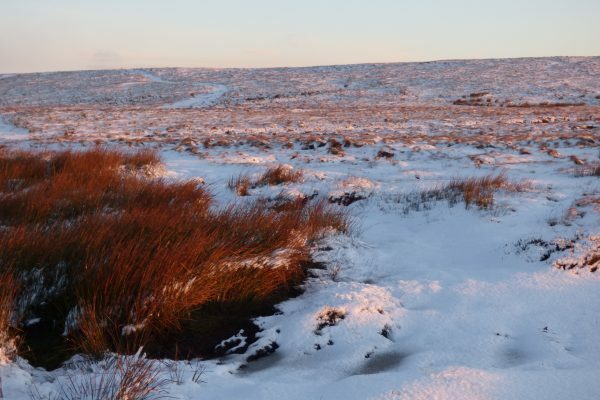 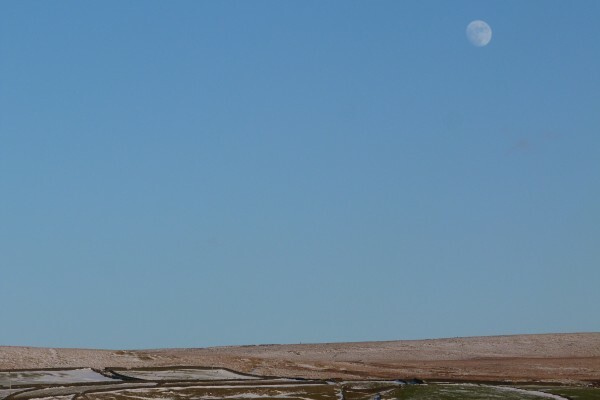 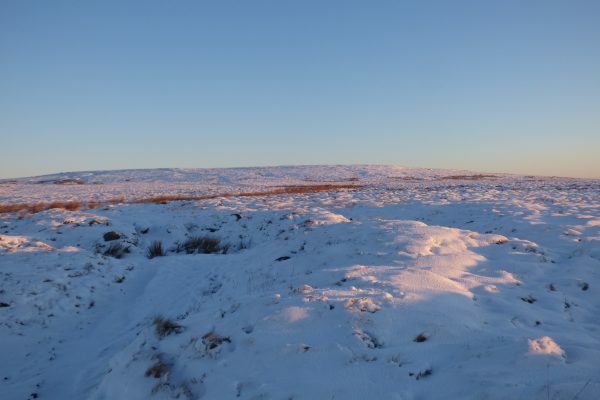 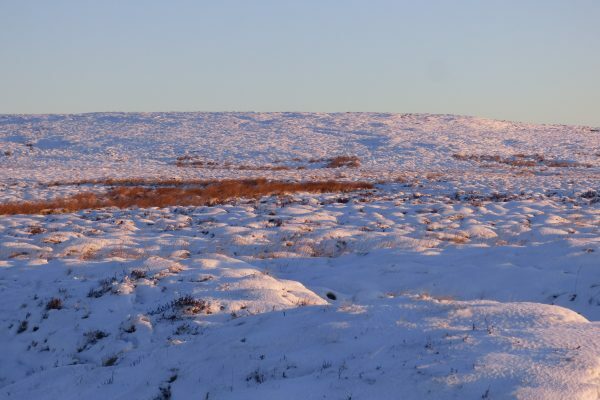 Skylarks, curlews, lapwings and golden plover all nest up here each spring, and the moorland provides a hunting ground for birds of prey, such as kestrels and short-eared owls. 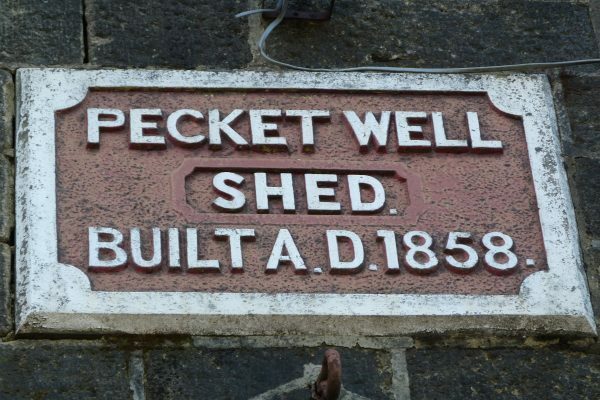 Pecket Well Mill, a cotton weaving mill developed from 1840 onwards, is the chief landmark in the village. 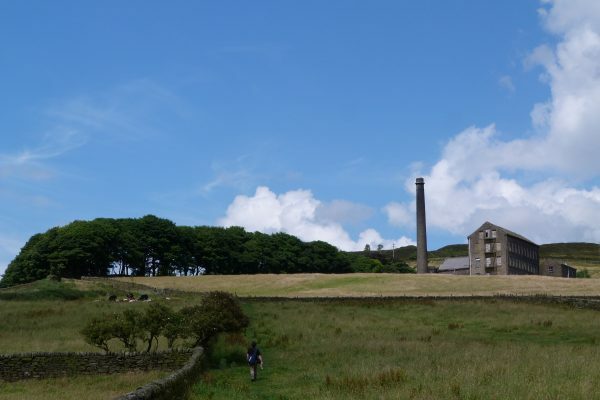 The main weaving shed was built in 1858 and the mill chimney with its distinctive red bands is visible for miles around. 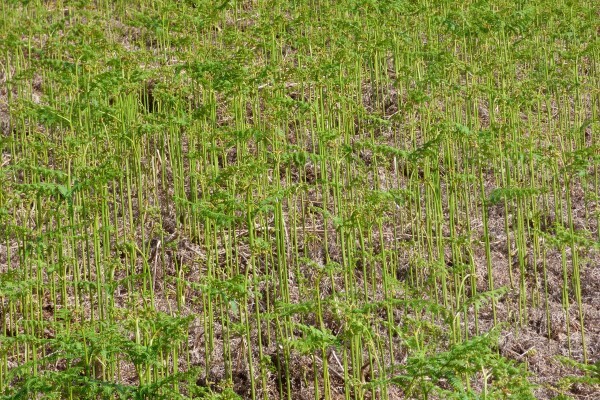 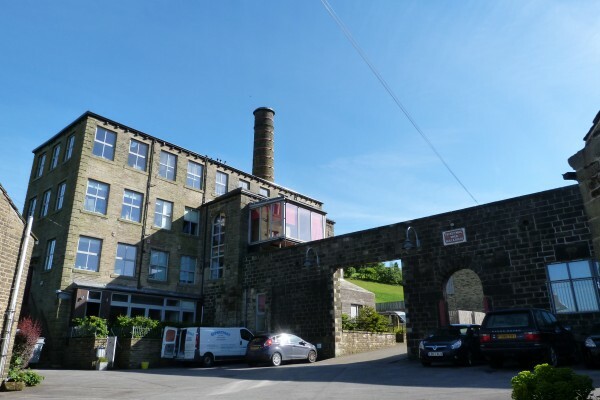 The mill specialised in fustian, a heavy cotton cloth used for menswear, including fabrics such as corduroy and moleskin. 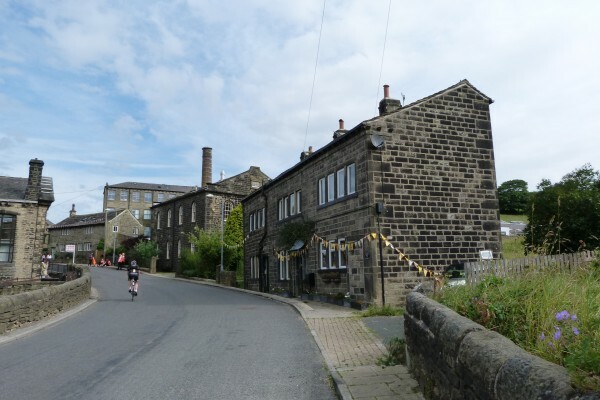 Pecket Well Mill provided the main source of employment in the village for many years and was the last fustian-weaving mill in Hebden Bridge. 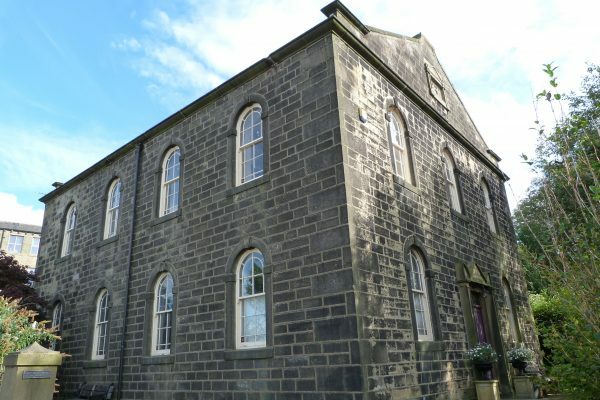 Weaving continued until 1998. 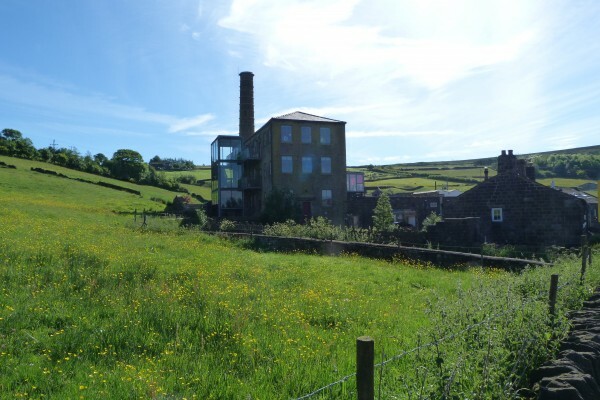 The mill then used for textile storage for a few years before being converted into housing. 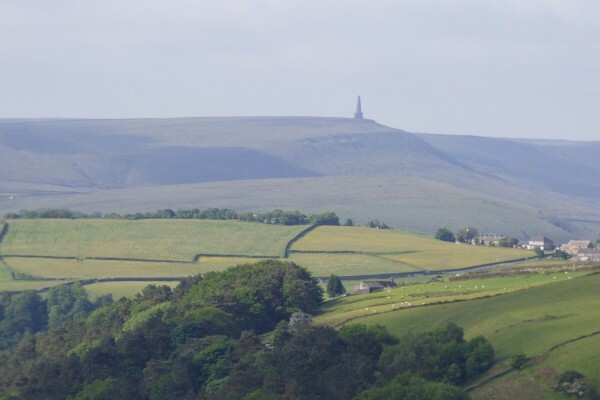 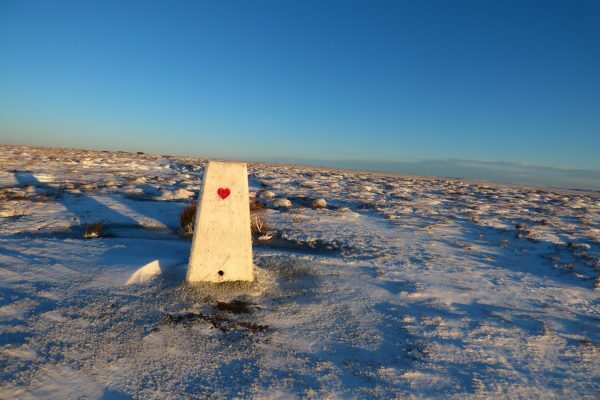 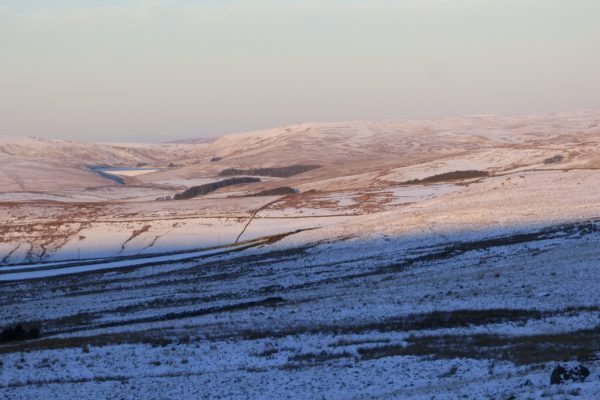 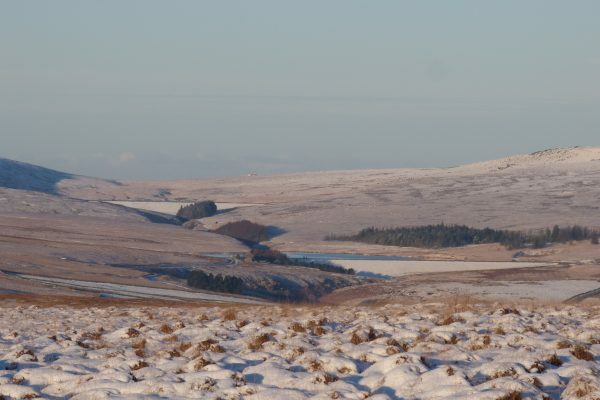 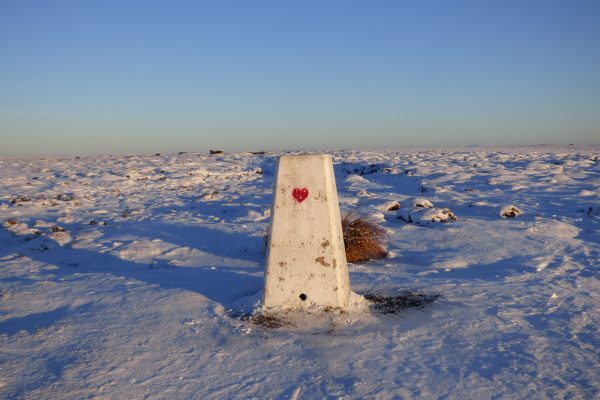 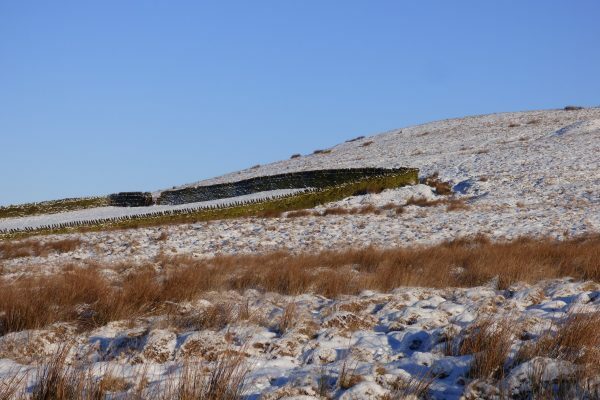 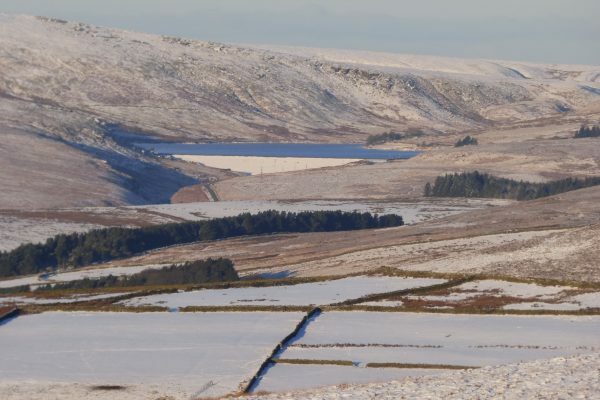 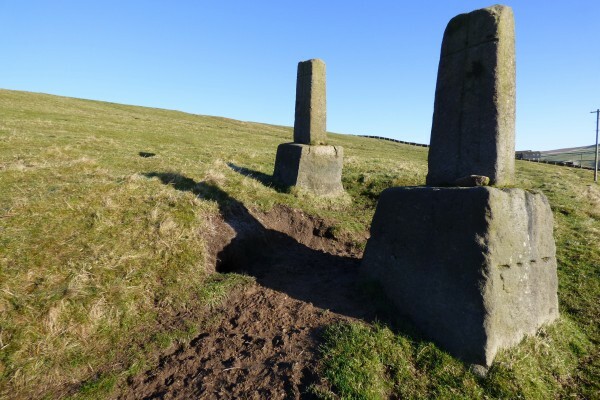 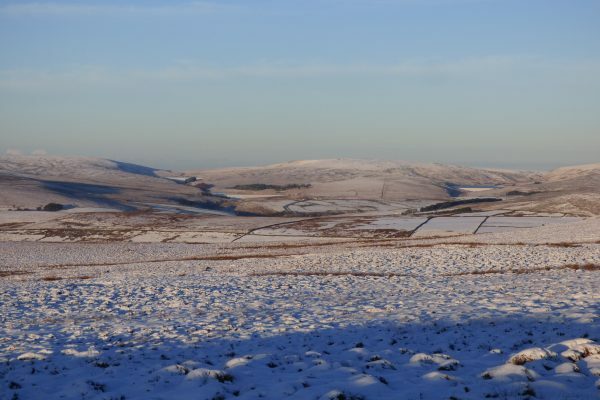 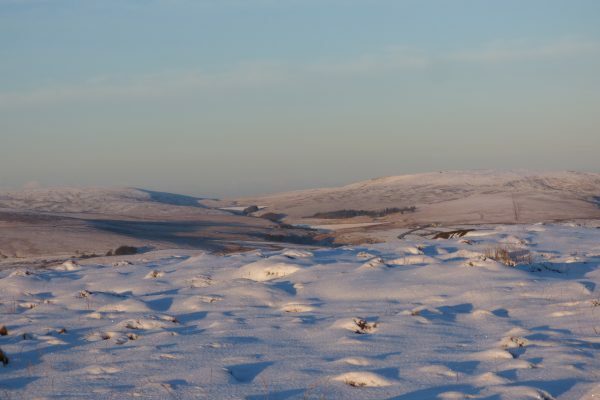 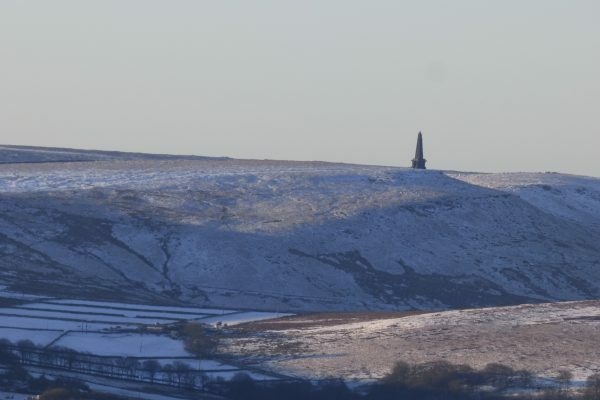 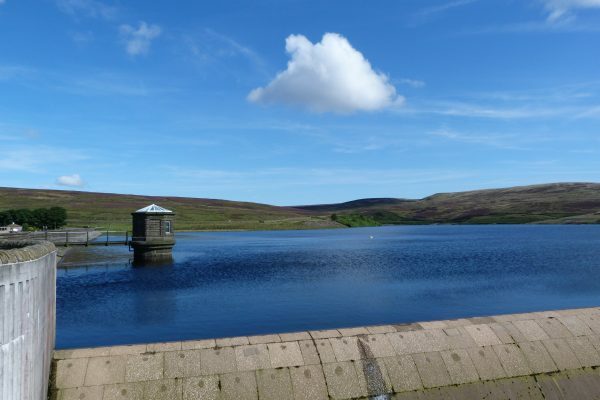 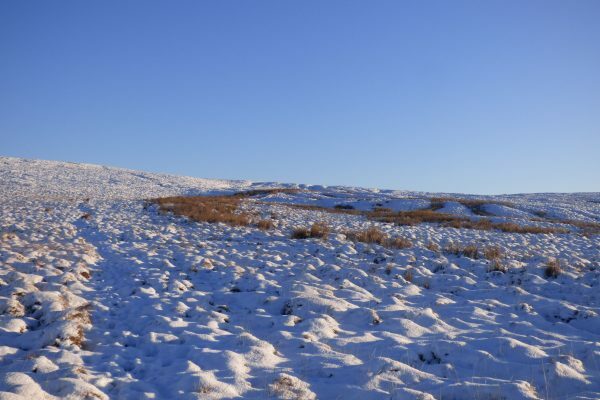 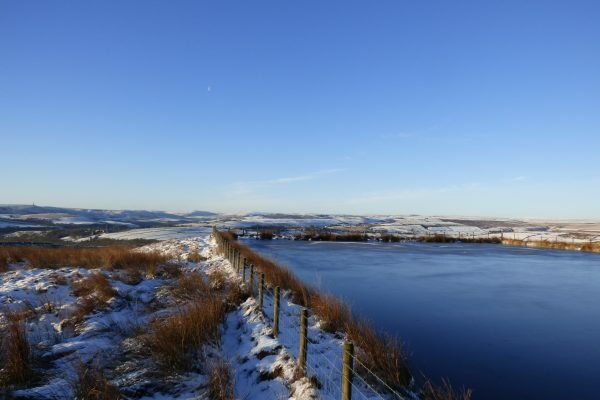 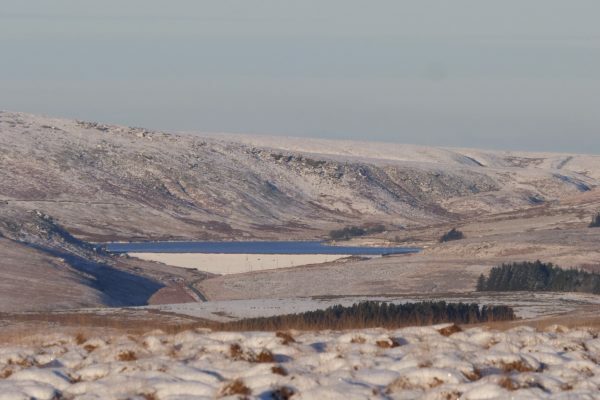 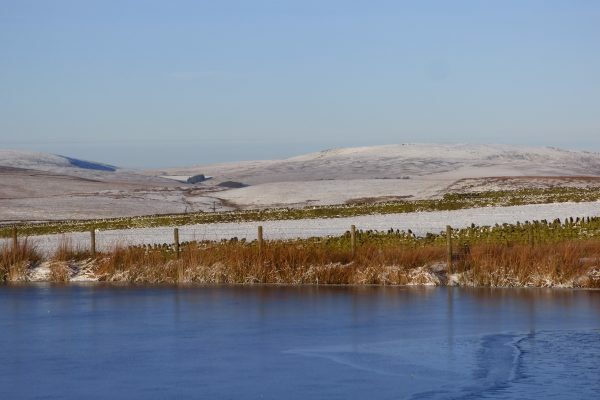 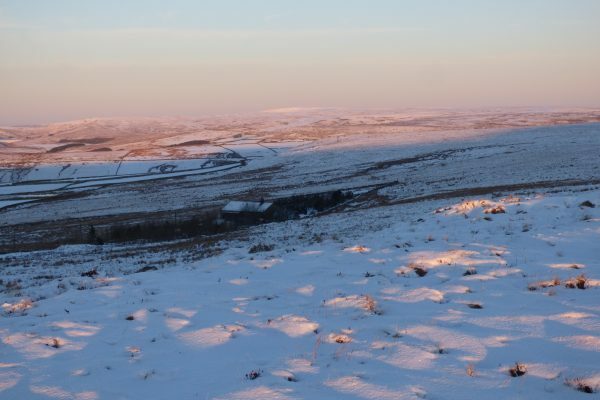 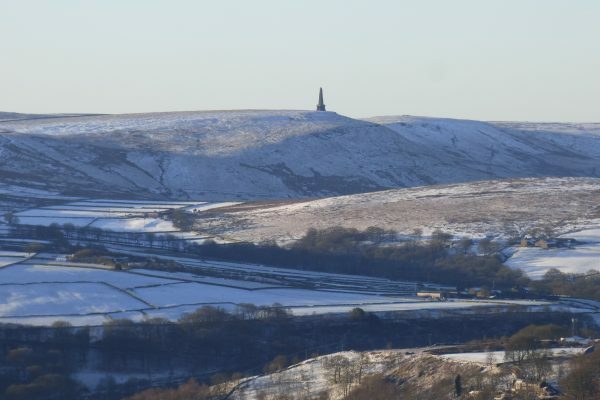 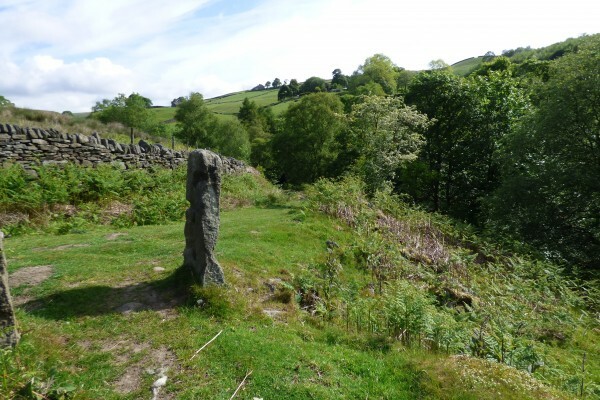 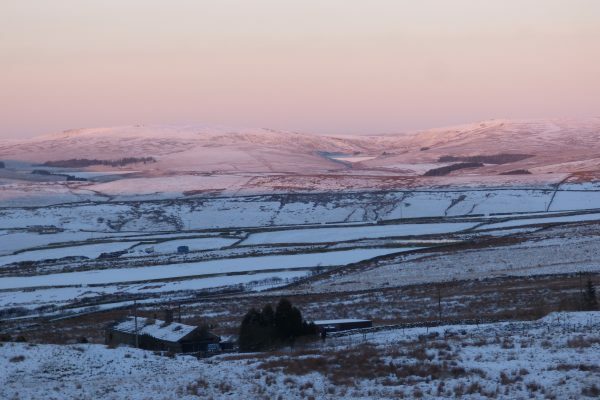 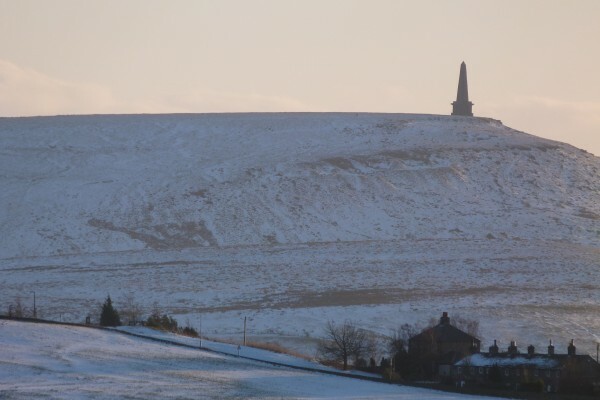 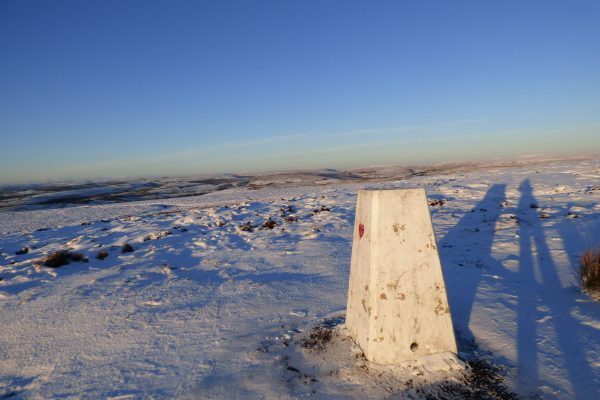 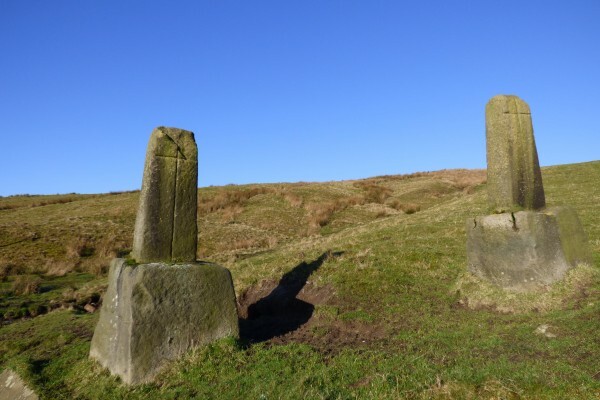 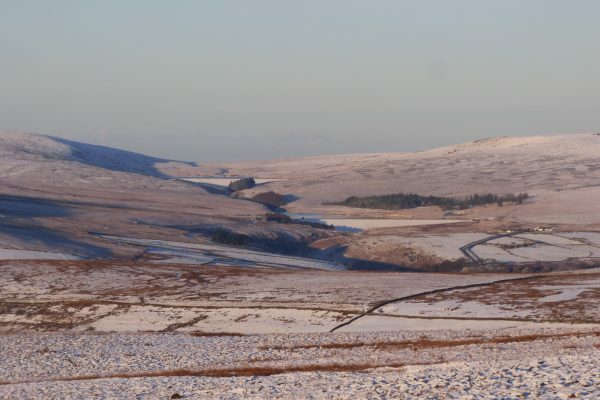 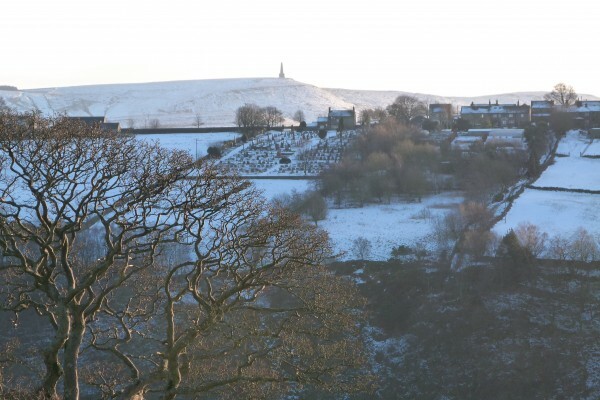 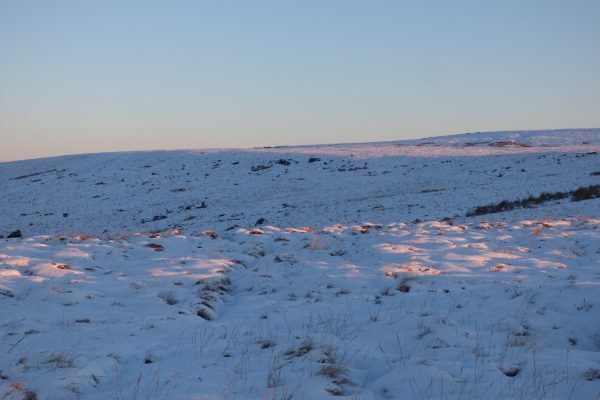 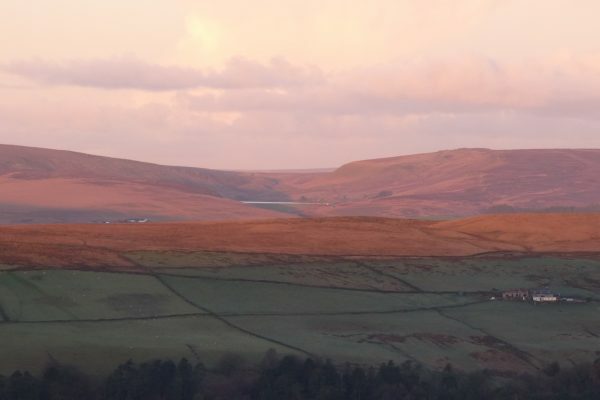 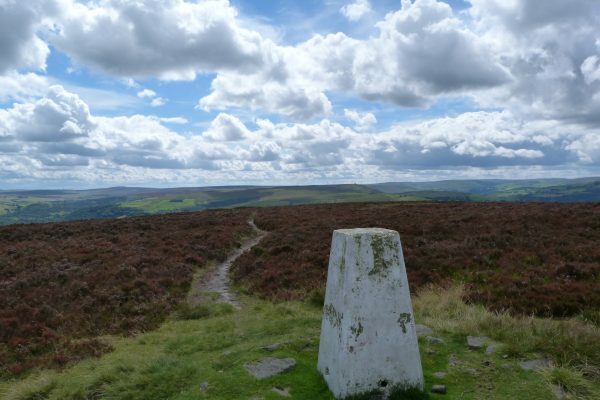 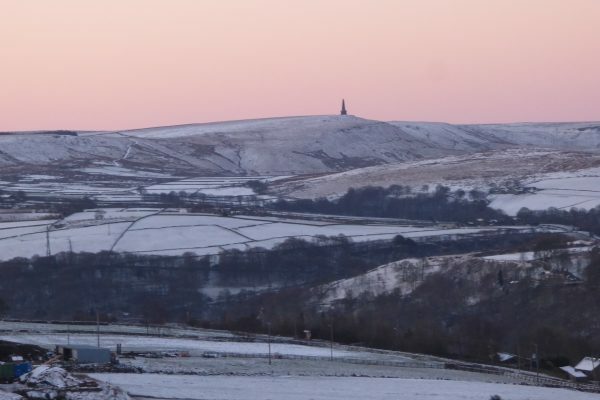 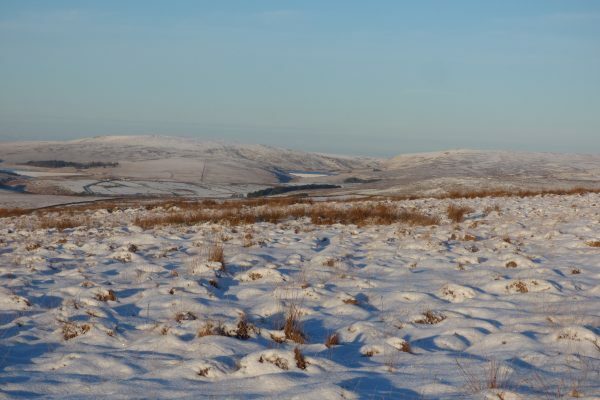 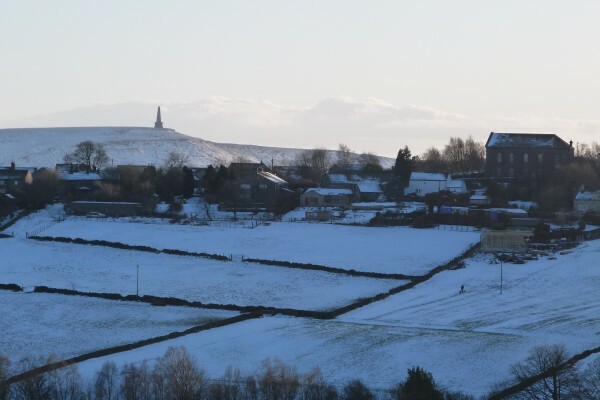 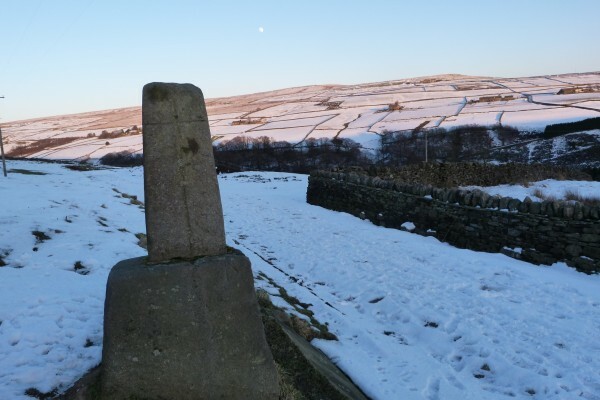 Another prominent feature of Pecket Well is the War Memorial, a stone obelisk on the crest of the hill above Hardcastle Crags, echoing the form of Stoodley Pike in the distance. 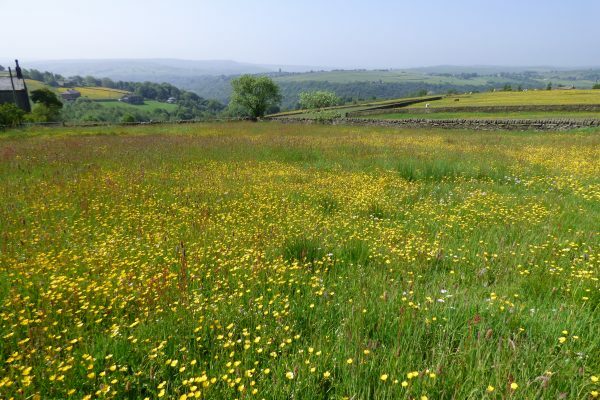 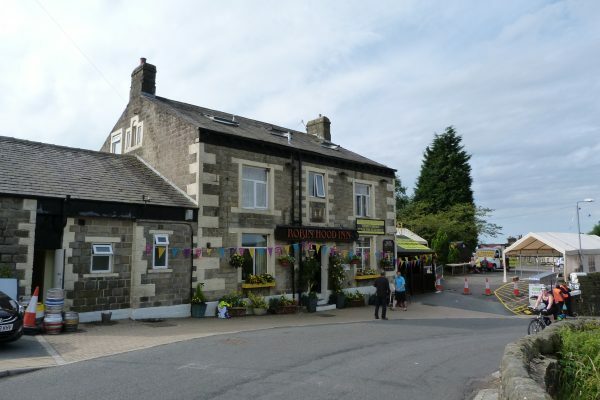 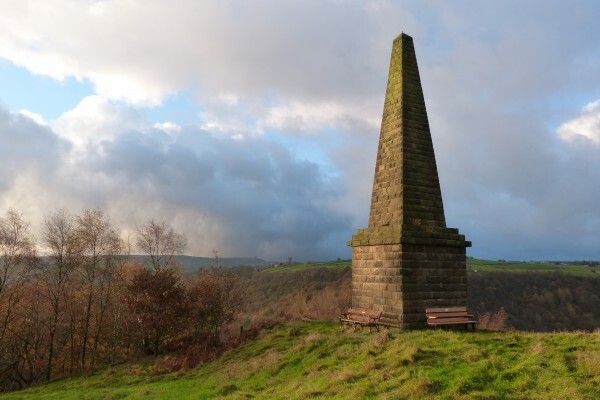 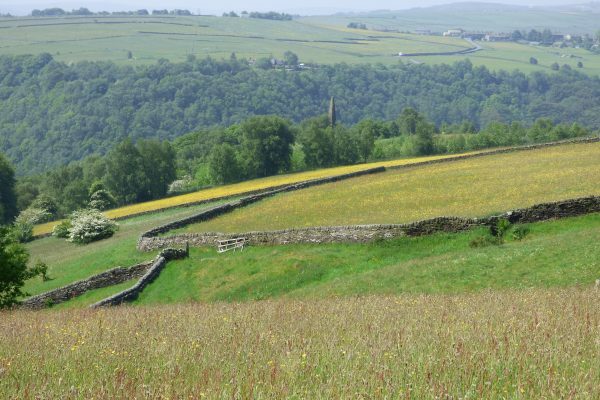 The War Memorial is a gentle stroll from Elmet Farmhouse across the hay meadows. 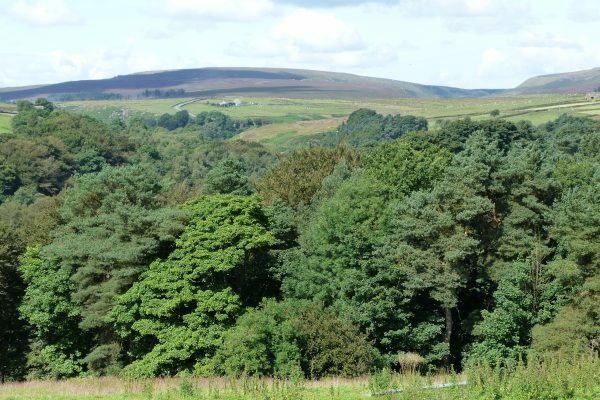 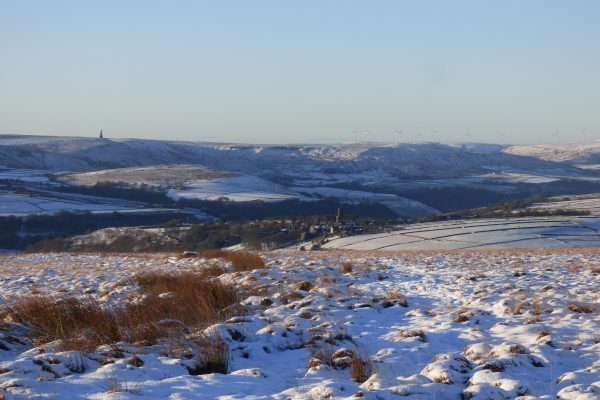 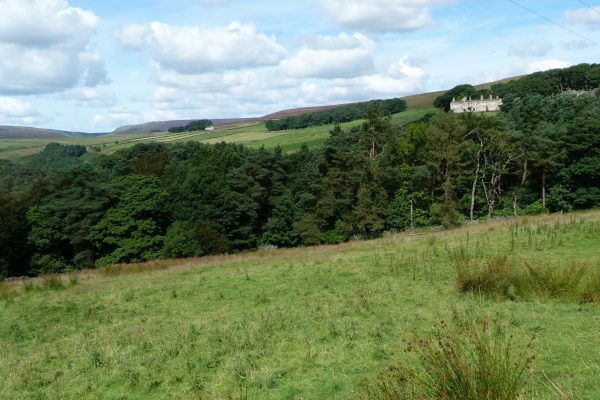 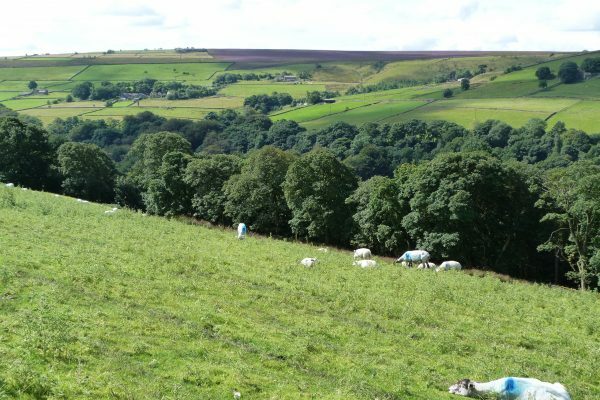 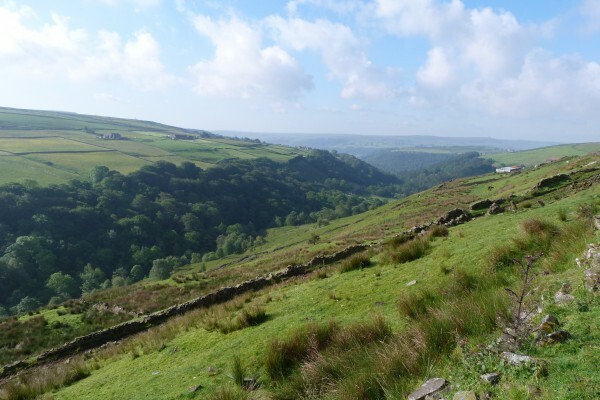 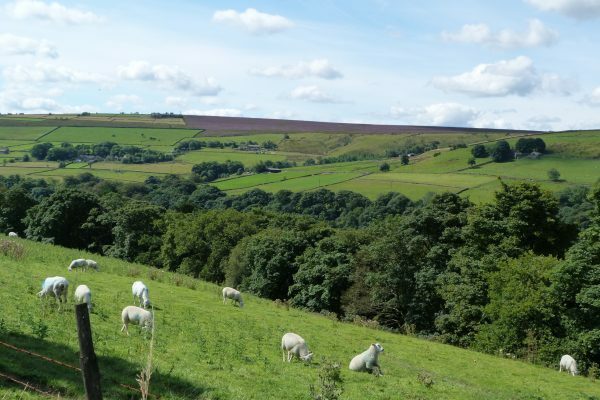 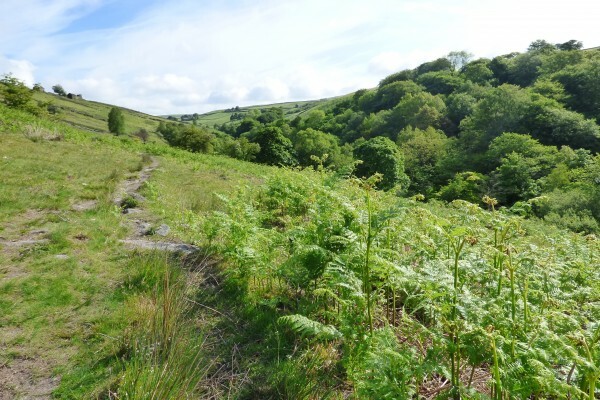 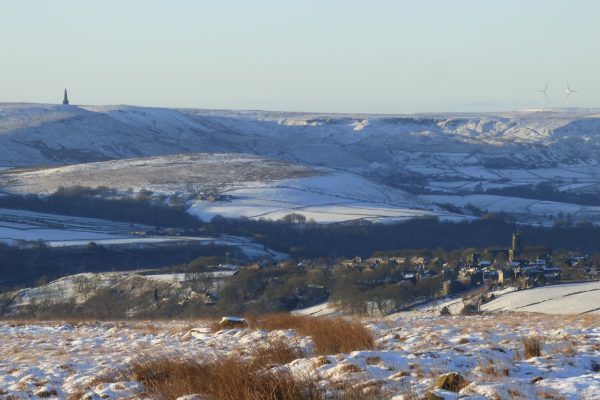 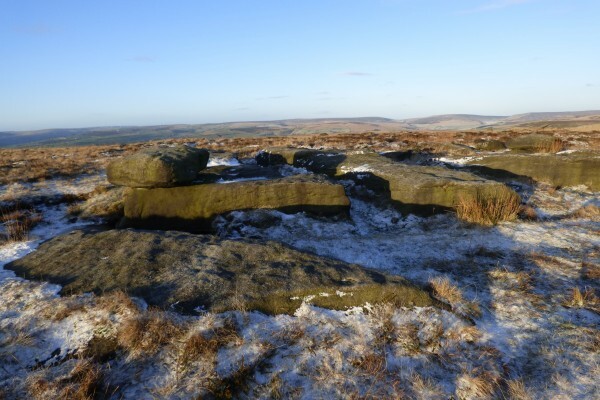 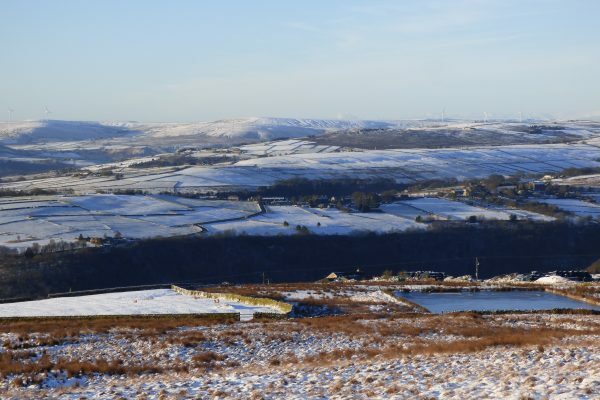 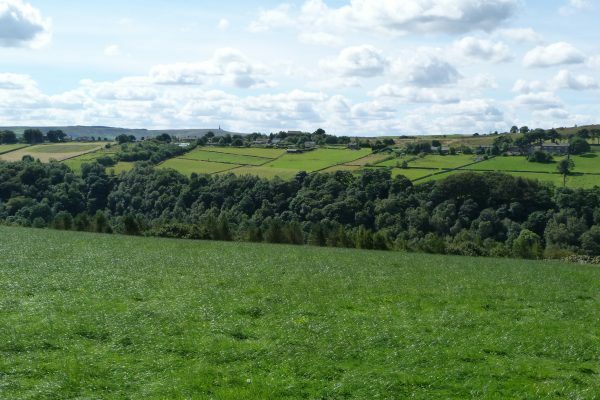 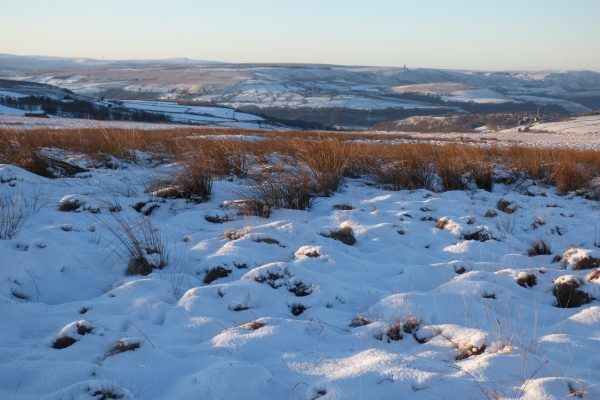 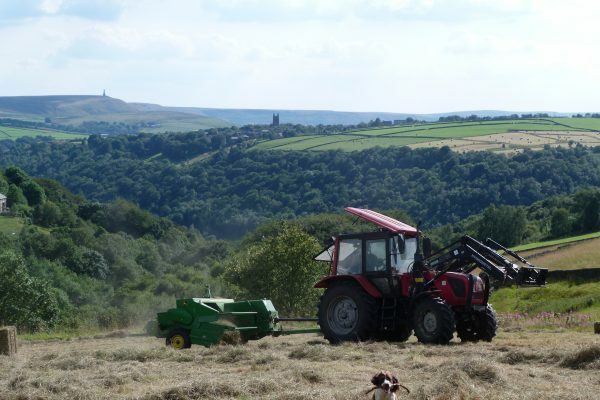 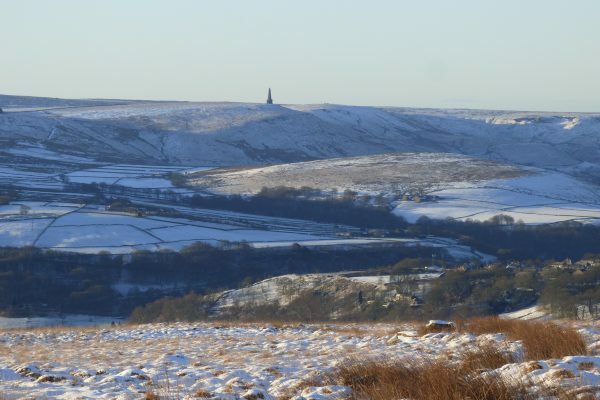 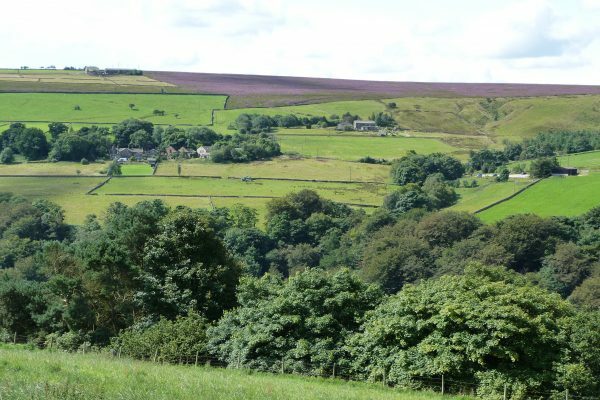 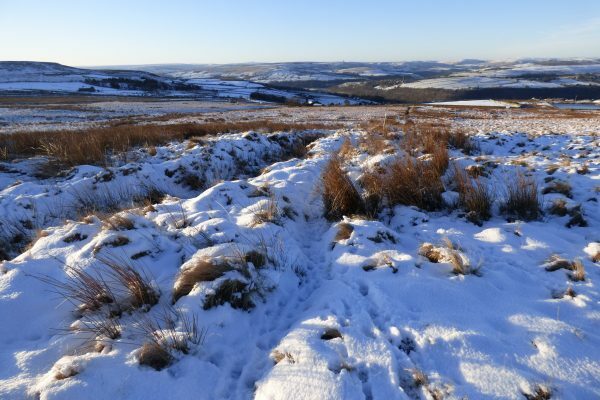 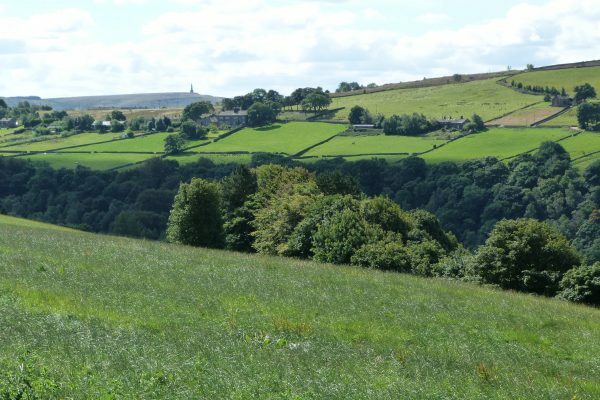 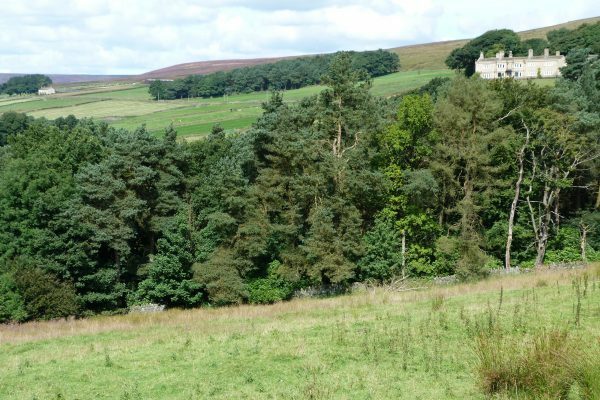 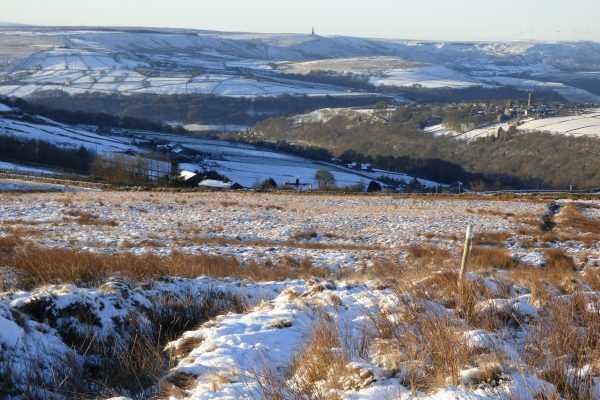 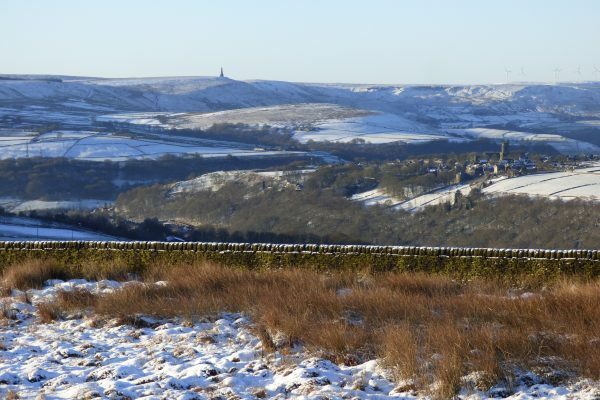 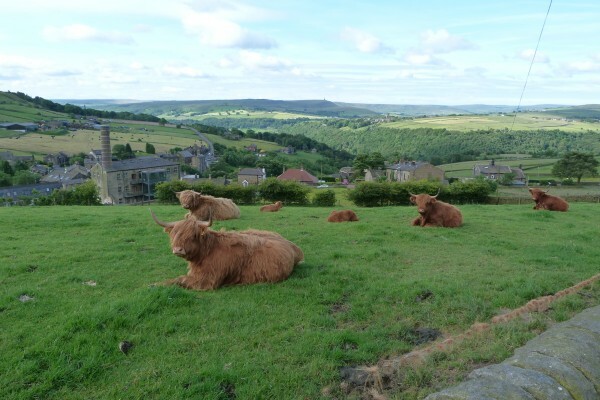 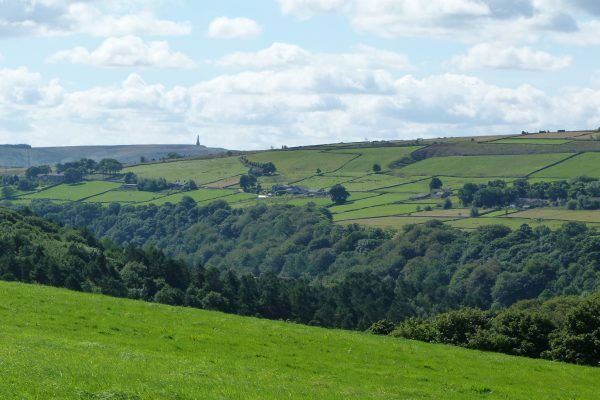 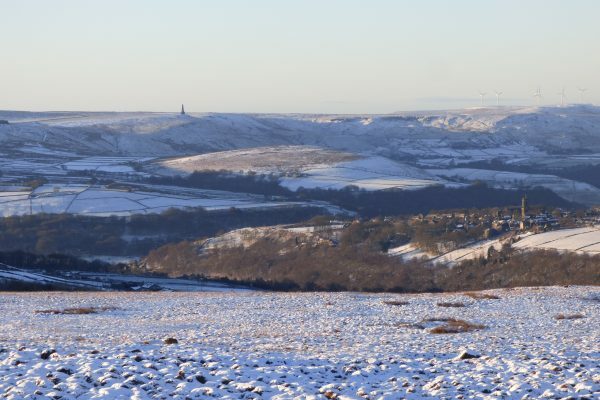 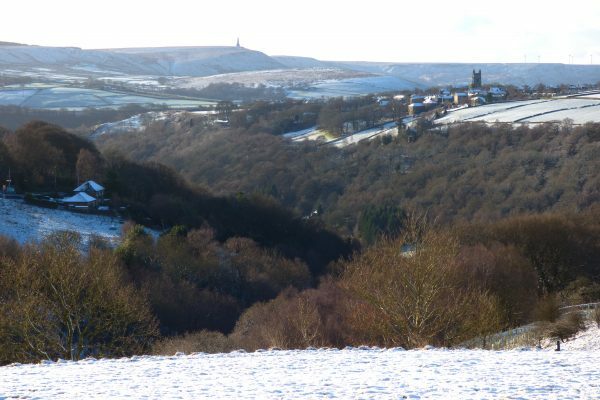 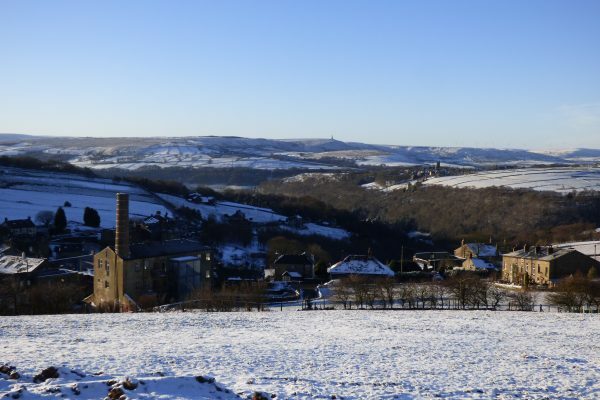 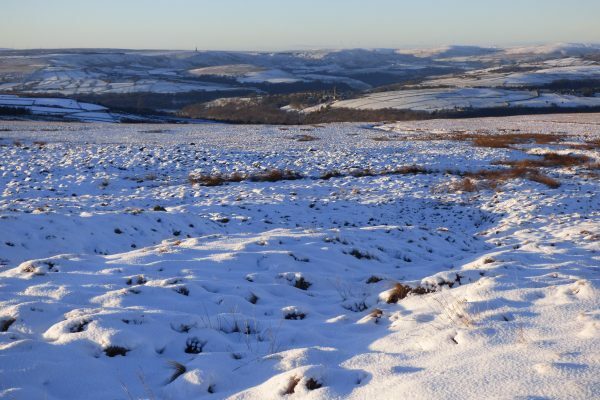 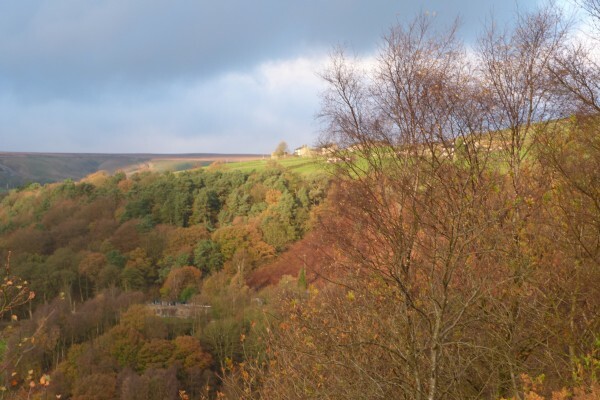 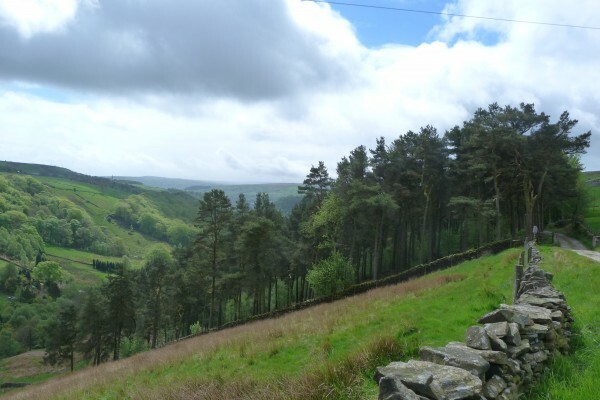 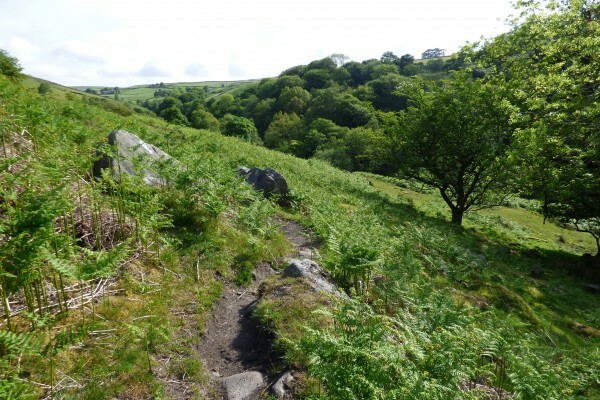 The perfect picnic spot, it has lovely views towards Heptonstall and Shackleton Hill. 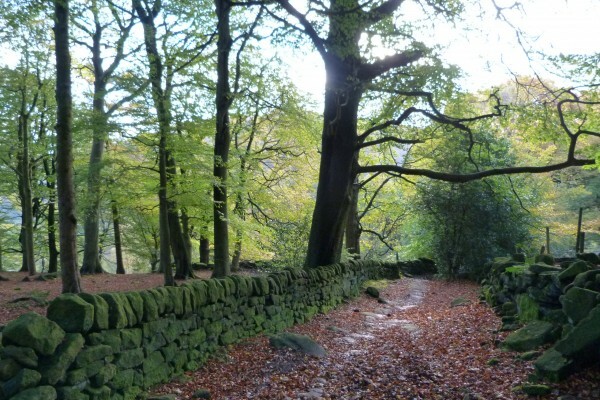 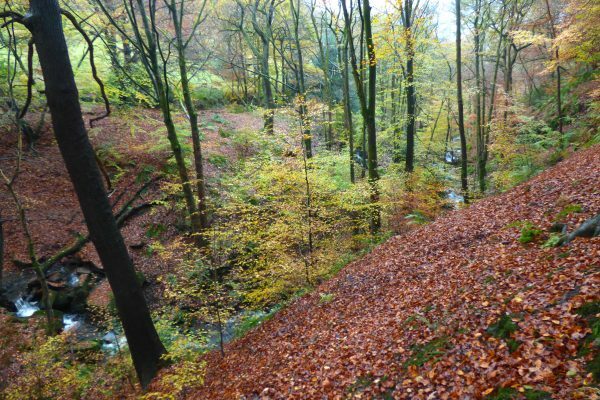 From here you can drop down to Mideghole via a stone-paved packhorse track through Pecket Well Clough, an area of woodland owned by the National Trust adjoining the main estate of Hardcastle Crags. 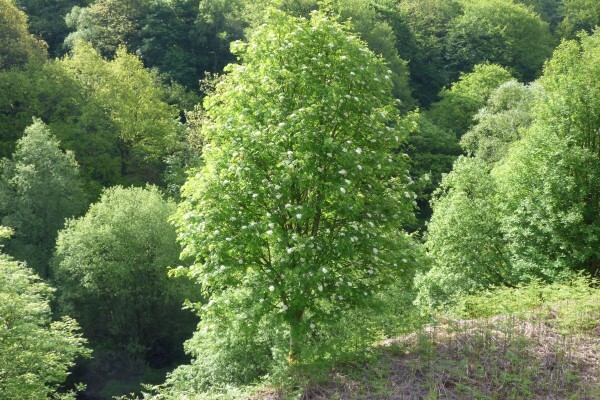 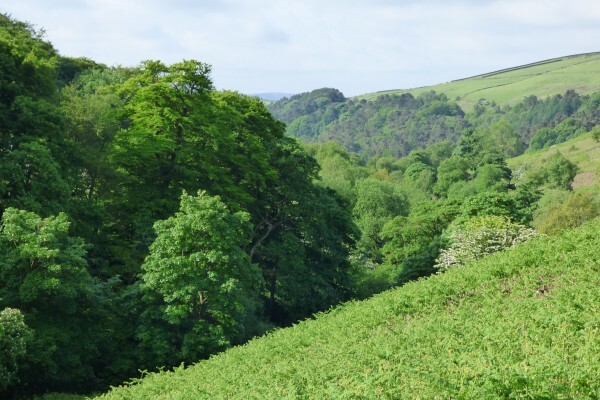 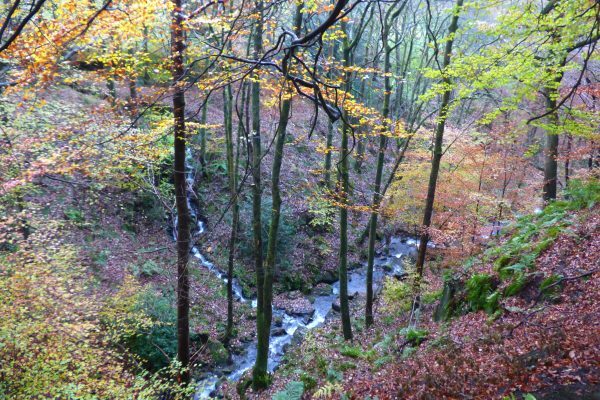 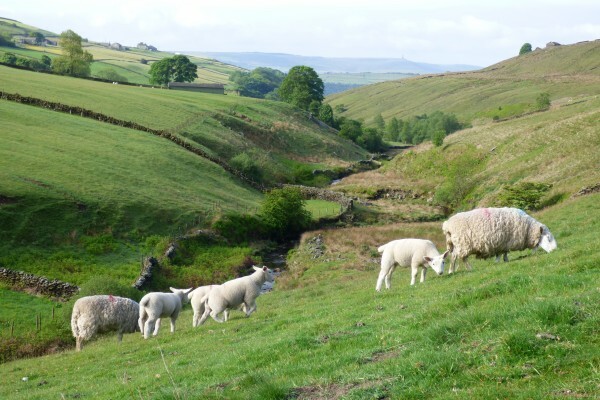 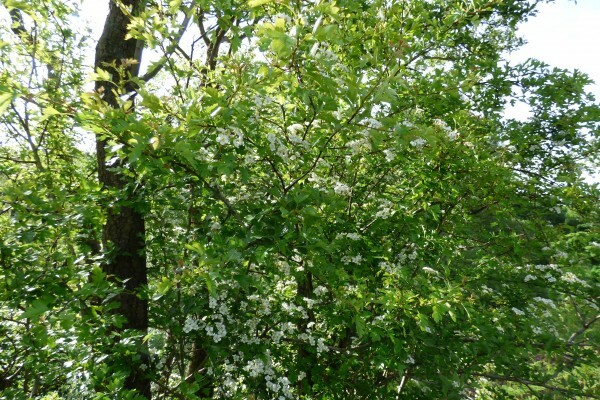 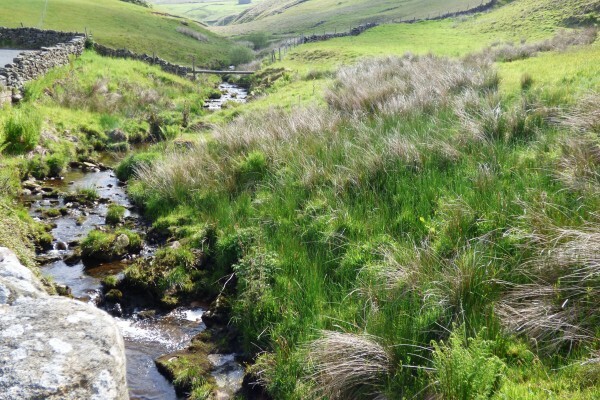 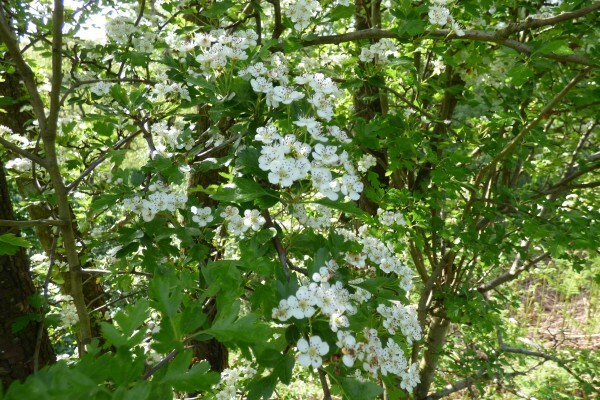 Crimsworth Dean is a beautiful secluded valley branching off to the left just beyond the village of Pecket Well. 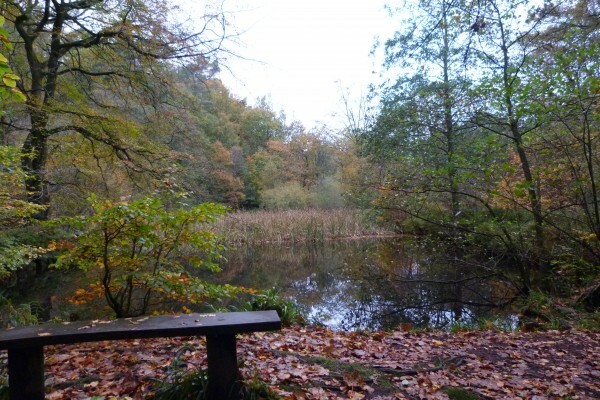 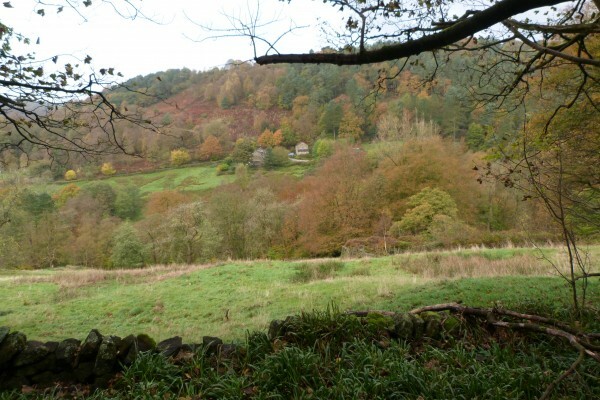 Partly owned by the National Trust, it’s close to Hardcastle Crags but is much quieter and less well known. 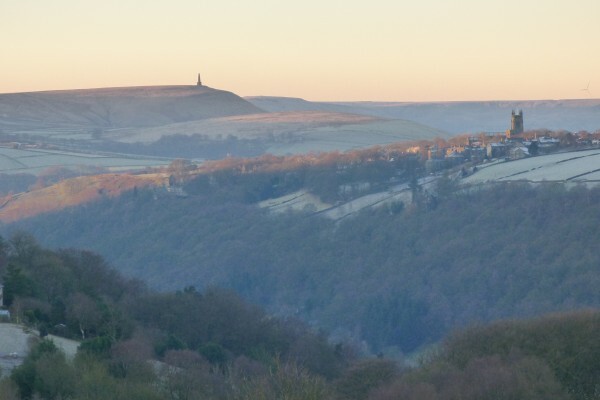 We call it ‘the secret valley’ because it’s full of hidden delights. 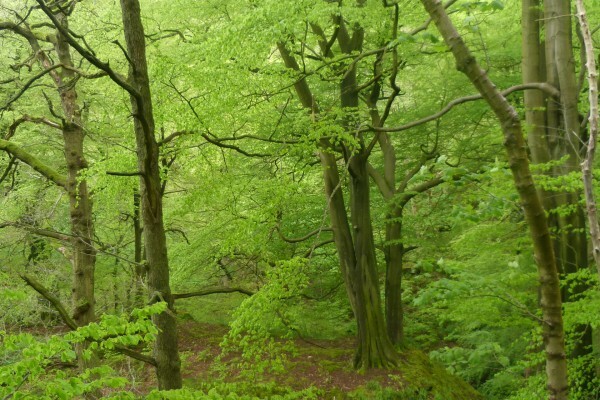 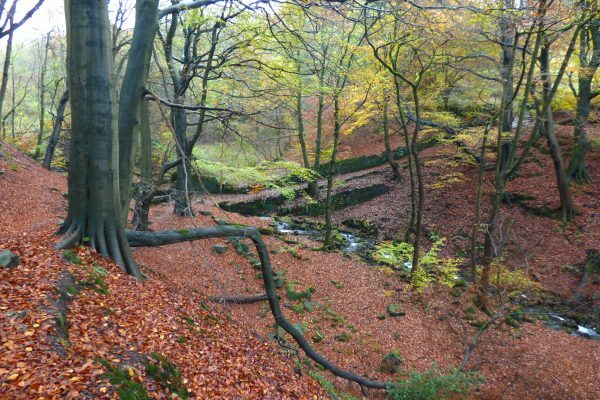 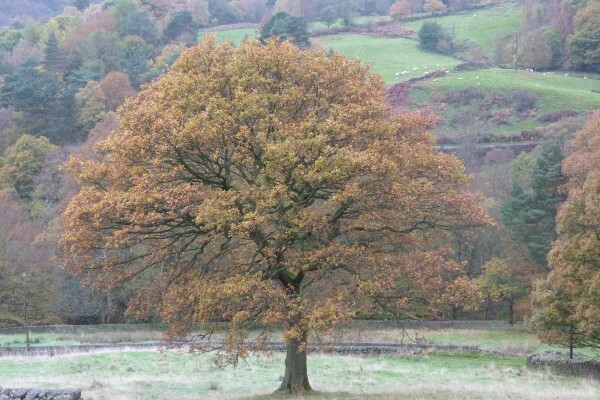 The bottom end of Crimsworth Dean is steep and wooded, much frequented by roe deer. 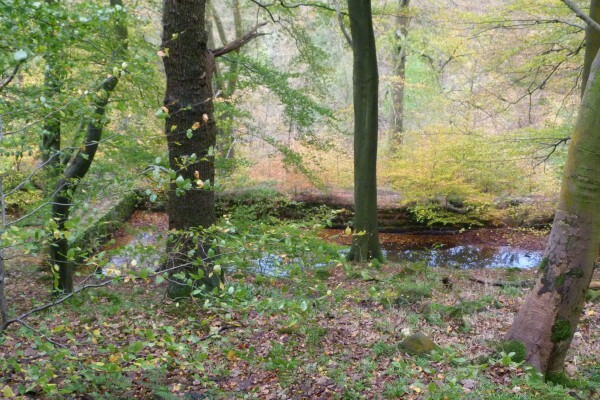 Running alongside the river is a series of old water courses and ponds, originally used to channel and store water for the mills lower down in the valley. 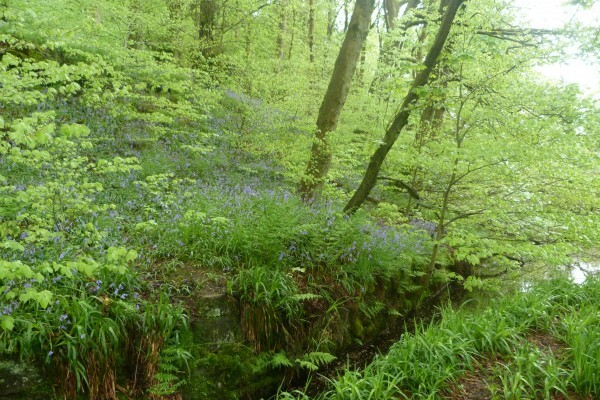 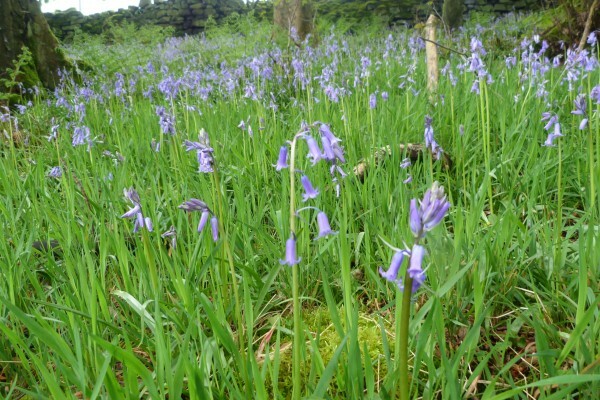 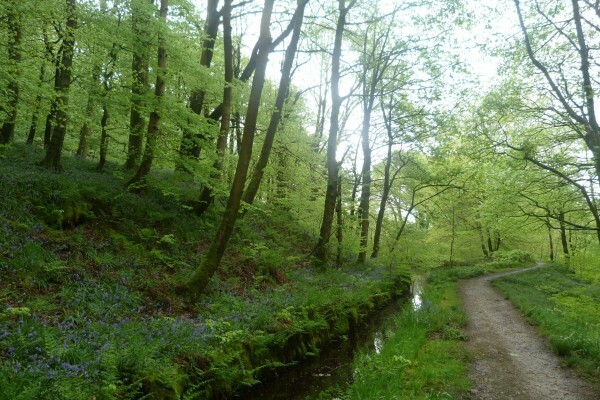 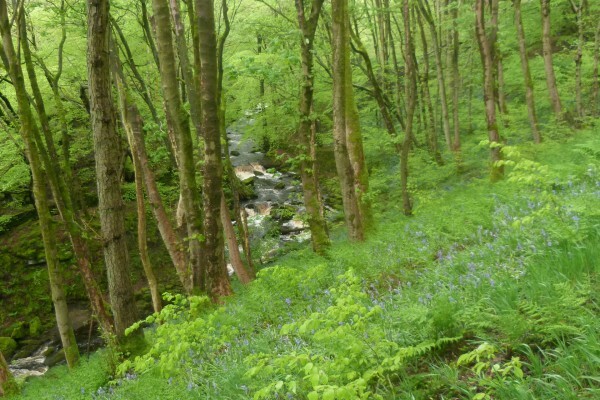 In May the woods in Crimsworth Dean are full of bluebells and wild garlic. 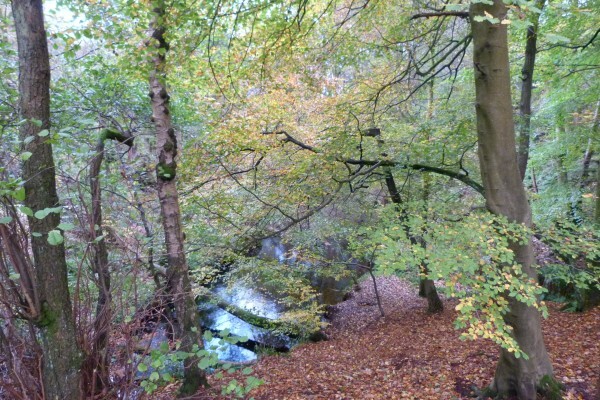 Autumn is equally spectacular as the beech trees turn from green to gold. 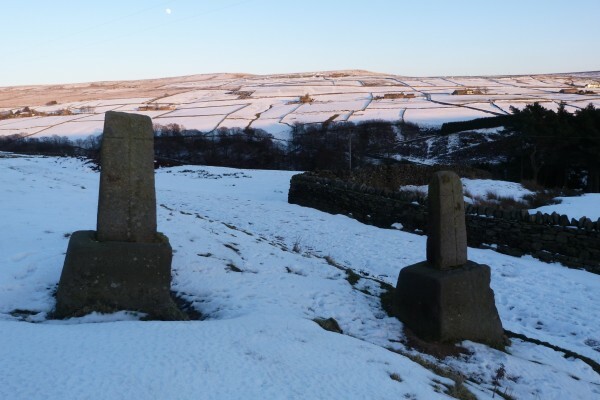 Crimsworth Dean used to be the main route to Haworth for centuries but was later superseded by a turnpike road running higher up over the moors. 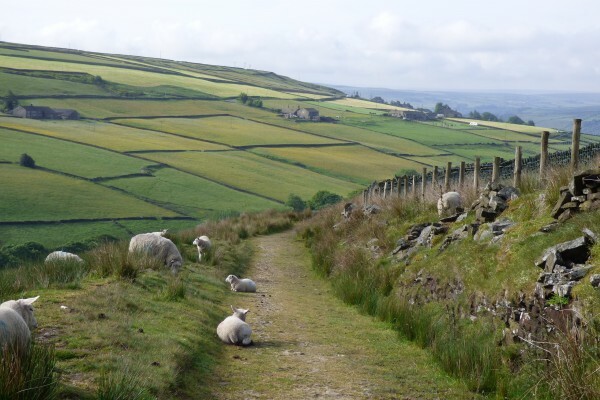 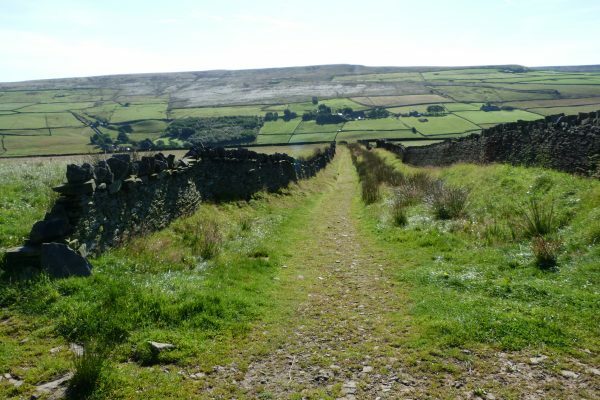 The Haworth Old Road, as it is still known, now peters out to a track at the top end of the valley after Grain Water Bridge. 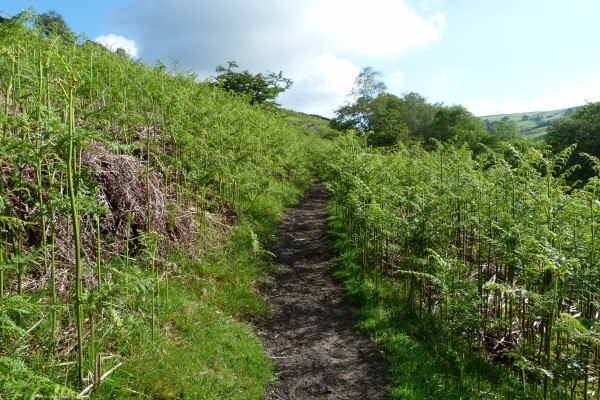 Half way along the valley, the path emerges from the woods into bracken and rough pasture. 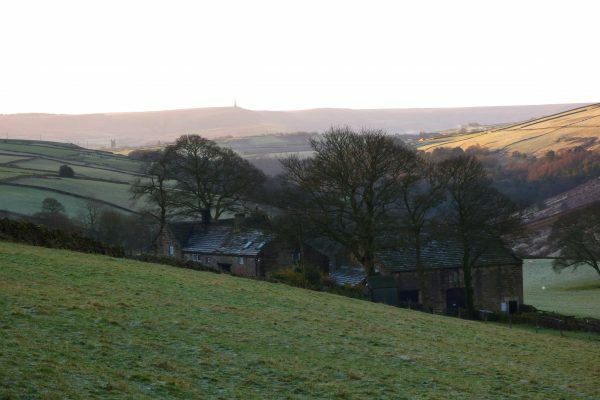 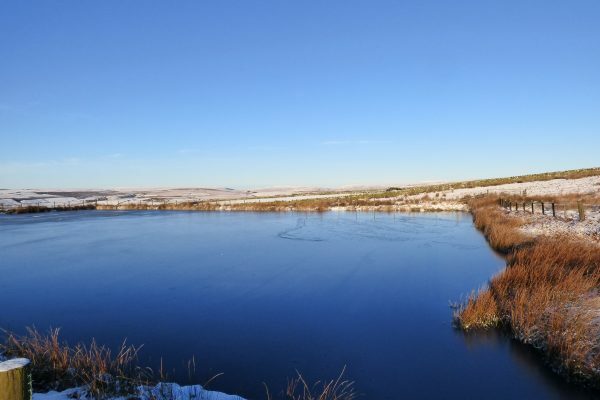 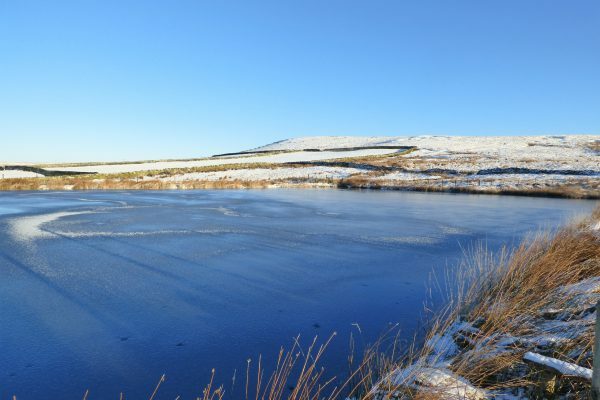 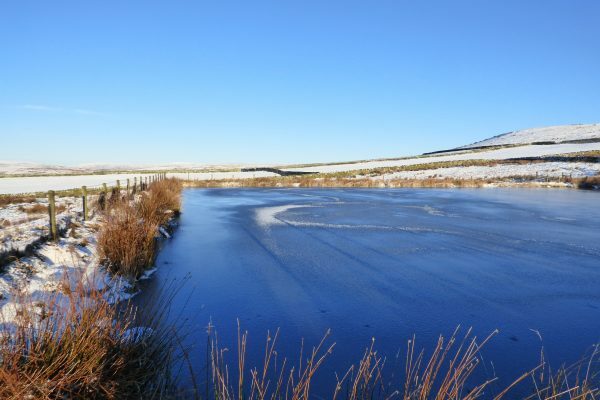 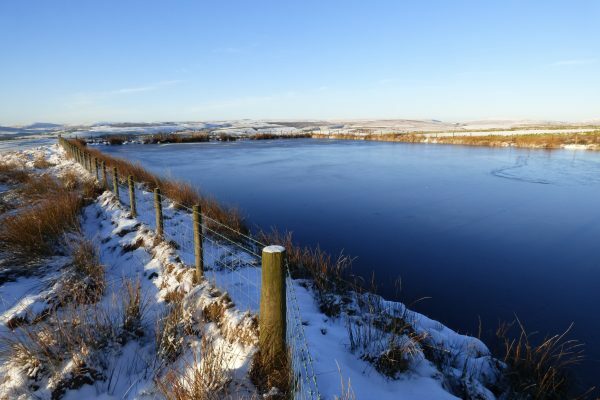 A haven for wildlife, Crimsworth Dean attracts a diverse array of birds, from oyster catchers, green woodpeckers and meadow pipits to goldfinches, kingfishers and barn owls. 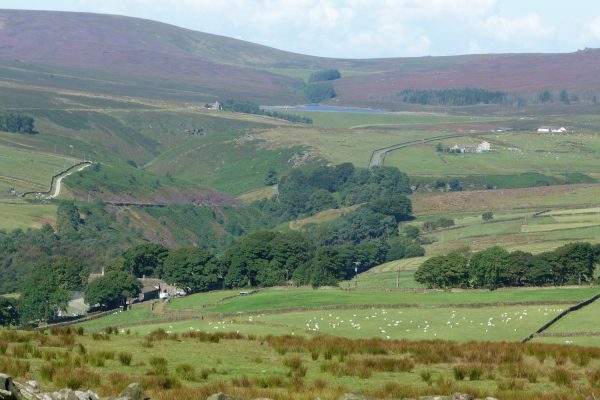 Buzzards circle overhead and curlews and lapwings arrive each spring to nest and rear their young on the lower fringes of the moors. 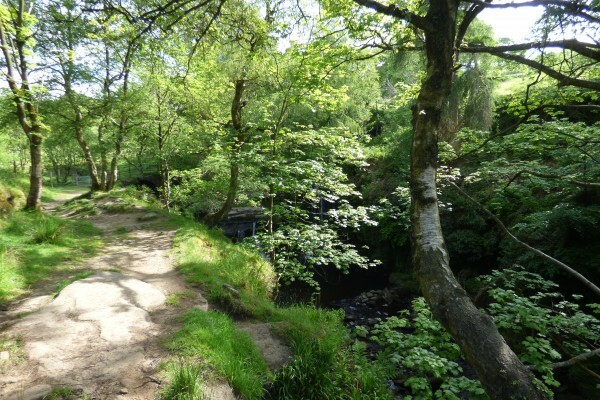 At Lumb Falls, where a stream carrying water down off the moors joins Crimsworth Beck, there are two waterfalls and an old packhorse bridge. 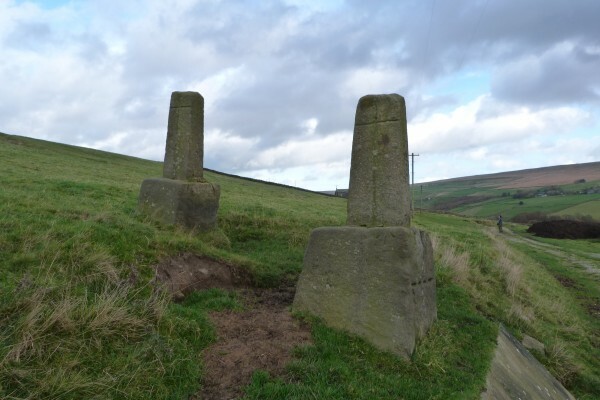 Ted Hughes’s poem ‘Six Young Men’ was inspired by a photograph taken at this spot, showing six young men shortly before going off to fight in the First World War. 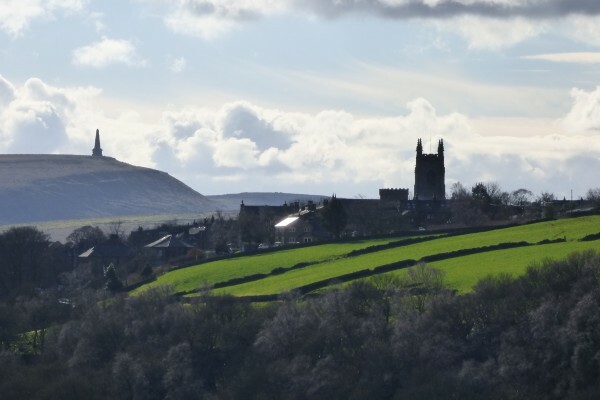 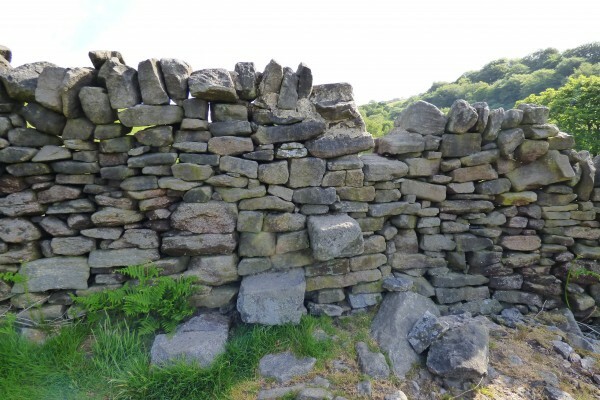 Crimsworth Dean held great potency for Ted Hughes and features prominently in Remains of Elmet, a collection of poems about his formative early years in the Upper Calder Valley. 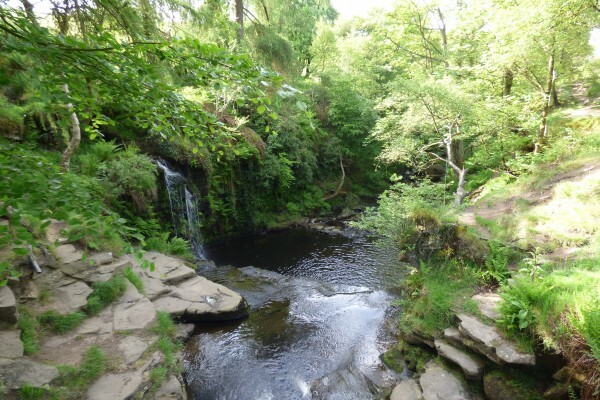 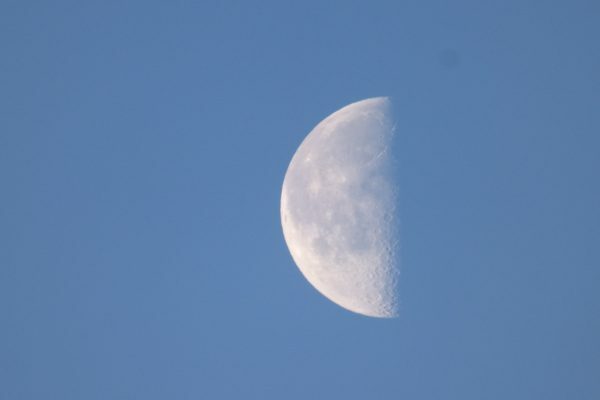 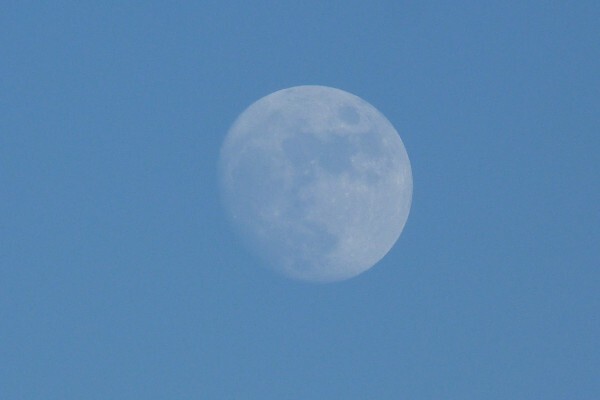 This was where he roamed as a child and it was here that he developed his fascination with the natural world. 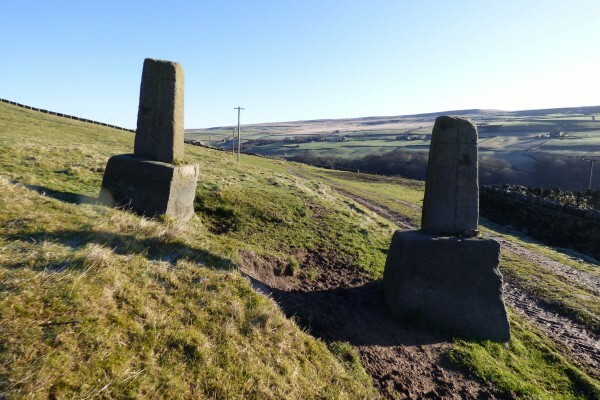 Remains of Elmet also includes a poem about Abel Cross, a pair of coffin stones in Crimsworth Dean. 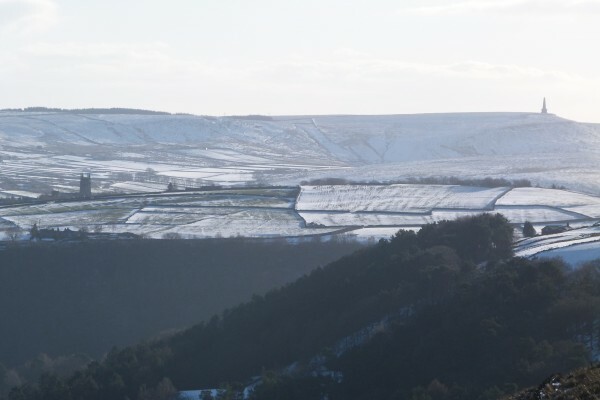 Published in 1979, Remains of Elmet was a collaboration with photographer Fay Godwin, whose powerful black and white images evocatively capture the austere beauty of the surrounding landscape. 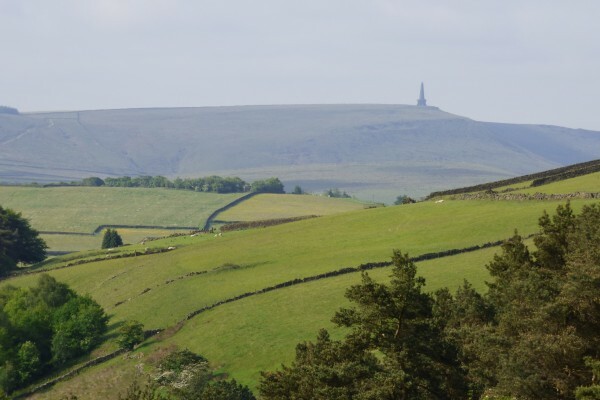 The photographer Martin Parr, who lived in Hebden Bridge during the 1970s, was also inspired by Crimsworth Dean. 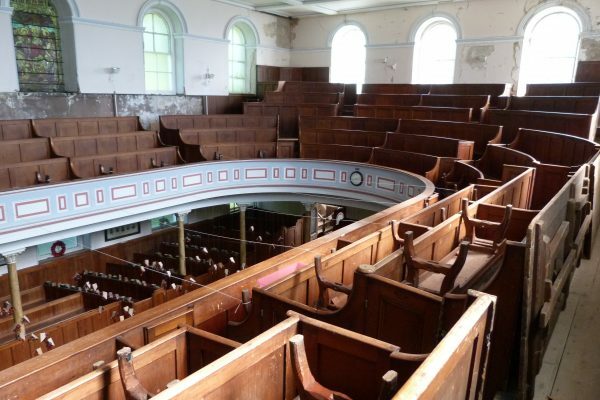 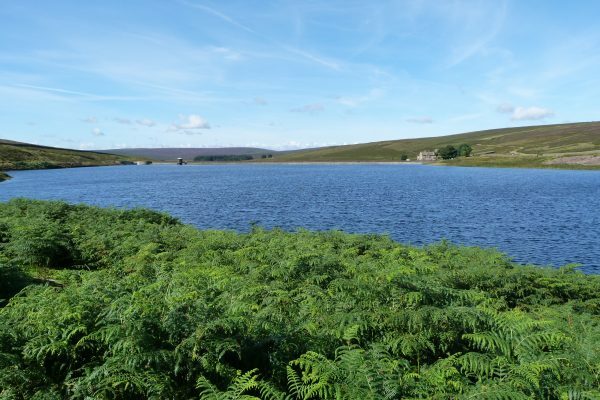 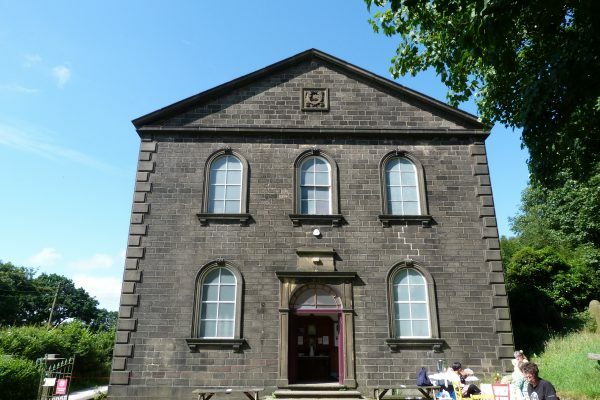 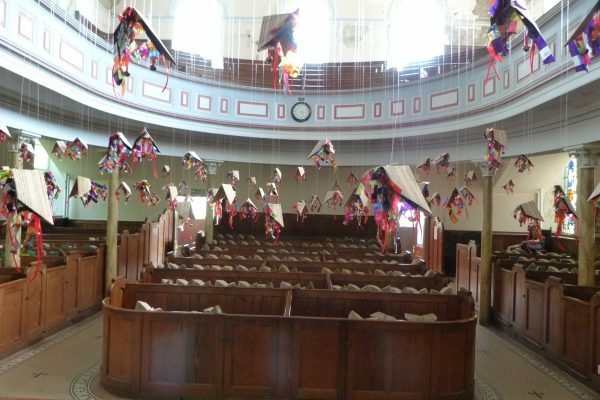 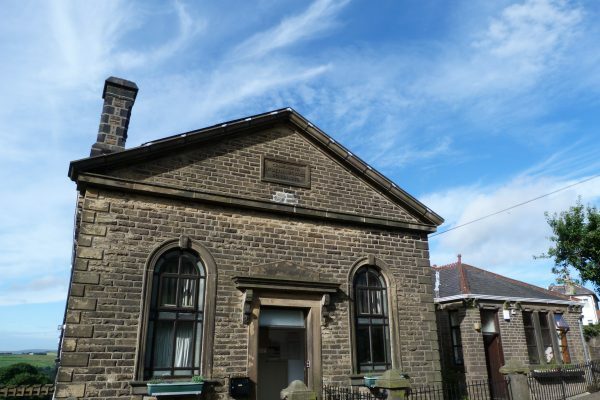 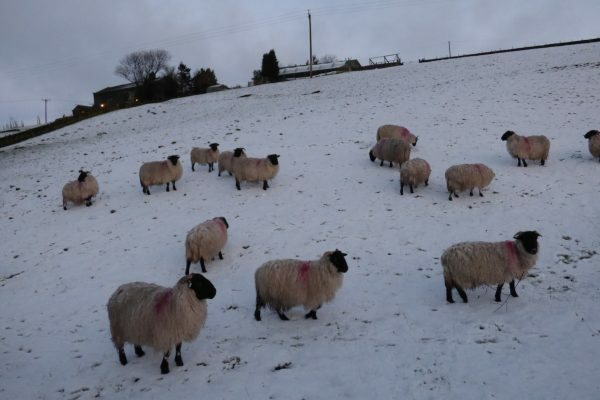 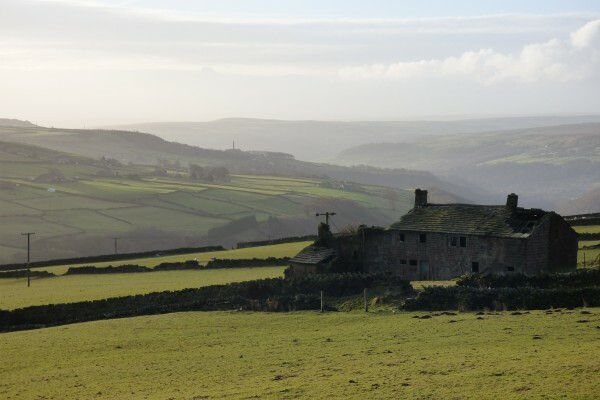 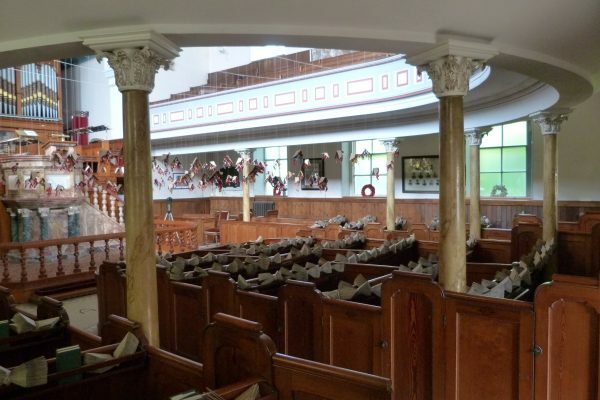 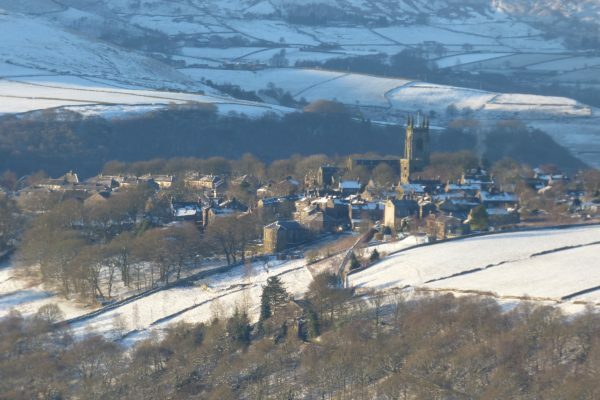 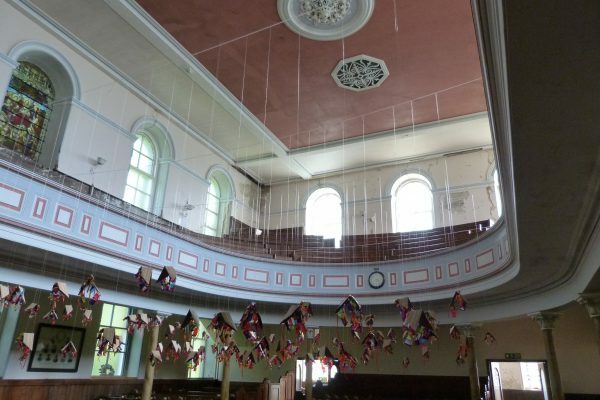 In his case it was the scattered farming community in this remote valley that interested him, particularly the dwindling elderly congregation of Crimsworth Dean Methodist Chapel. 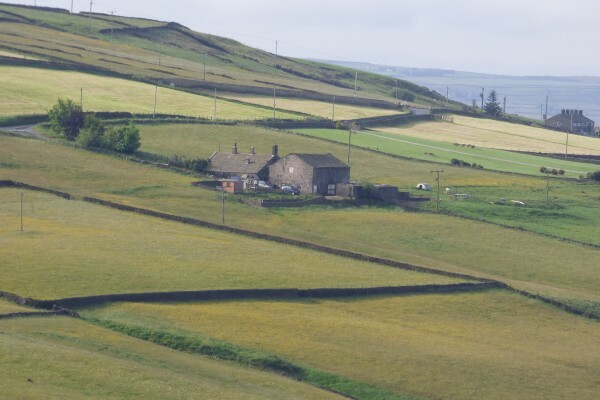 His photographs from this period were published in a book called The Non-Conformists in 2013 with a commentary by his wife Susie Parr, who lived in Pecket Well at the time. 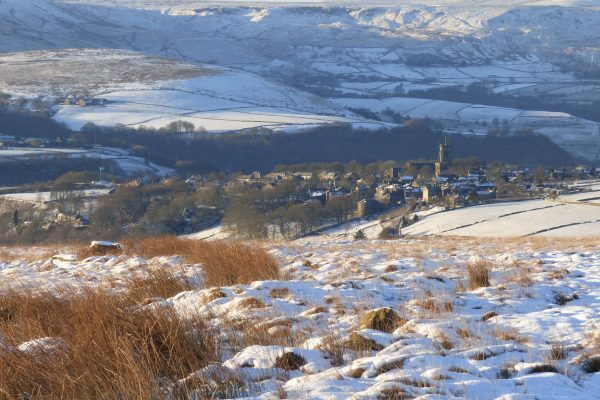 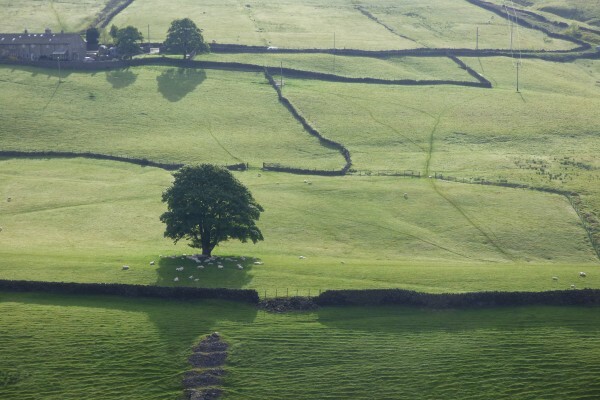 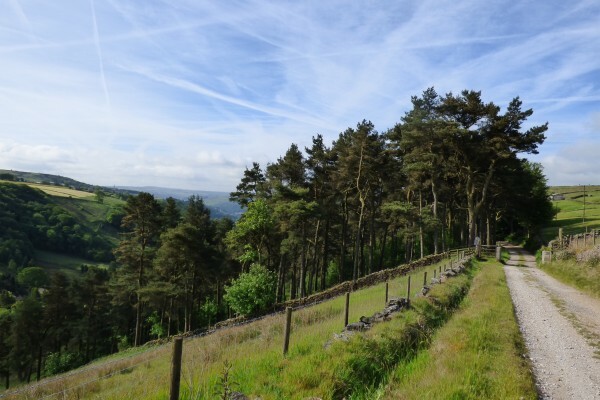 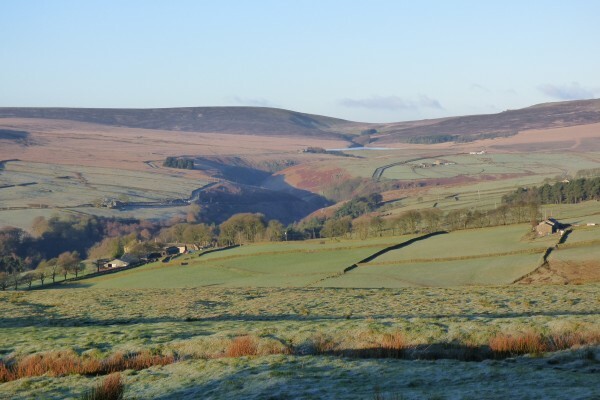 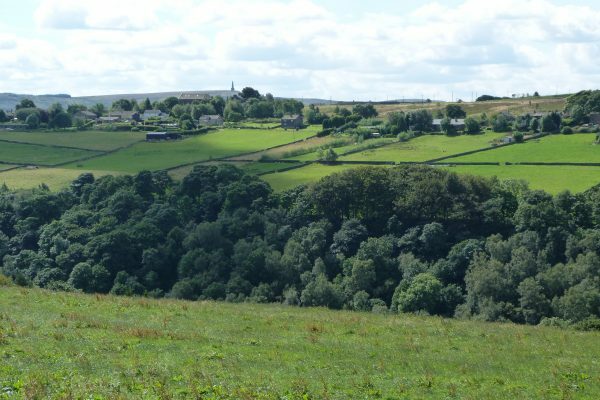 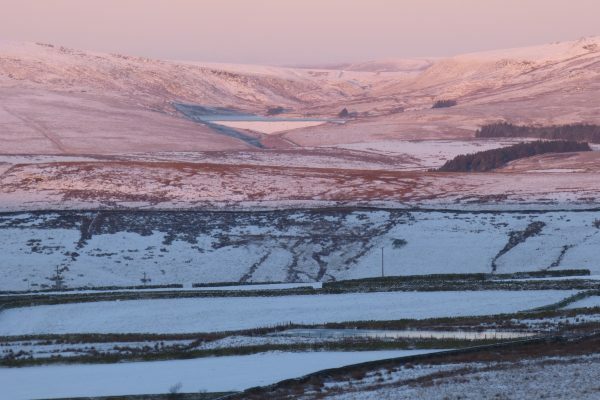 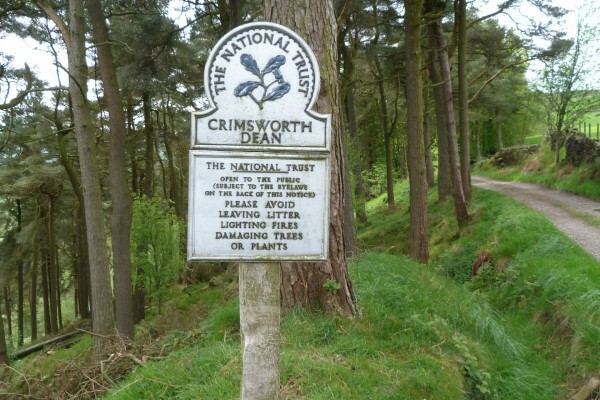 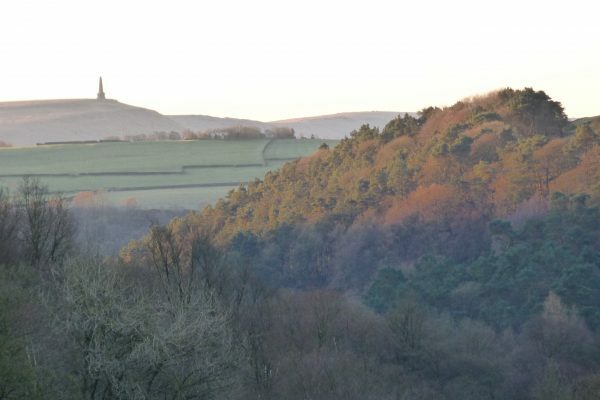 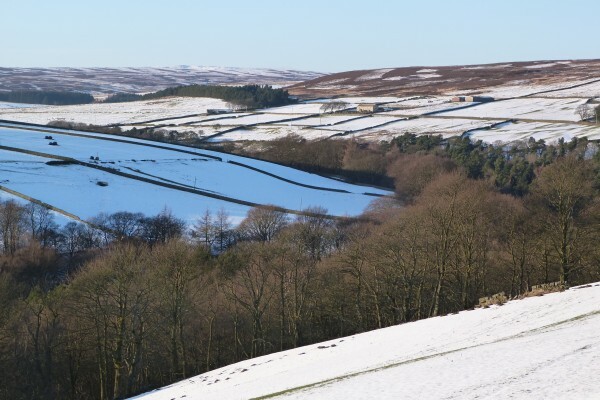 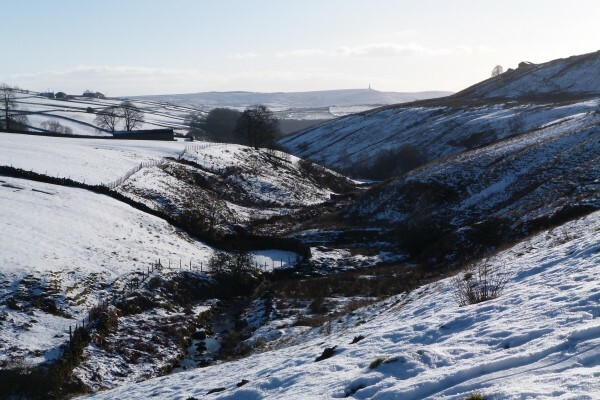 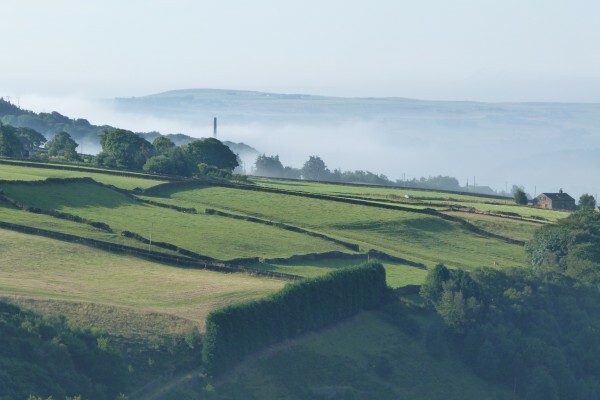 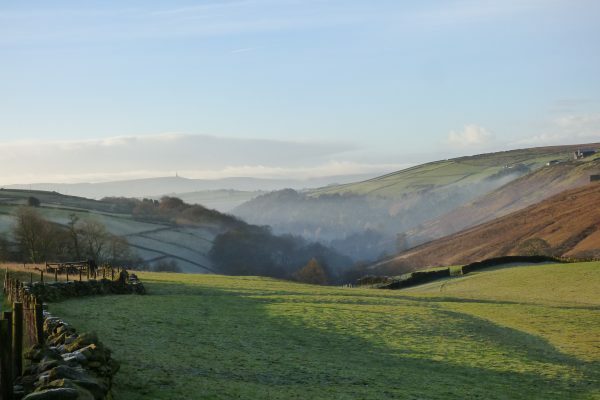 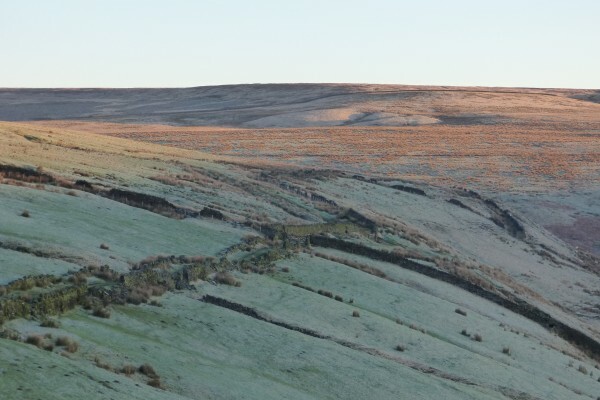 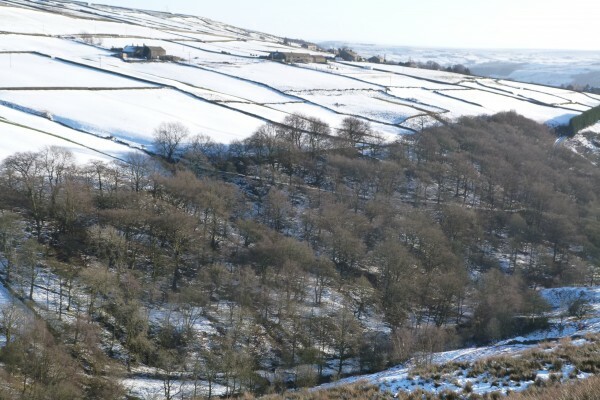 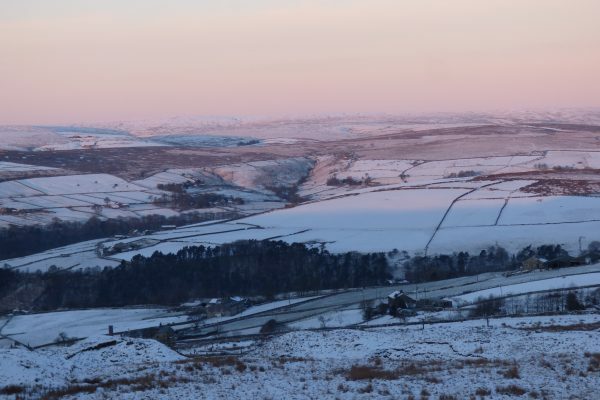 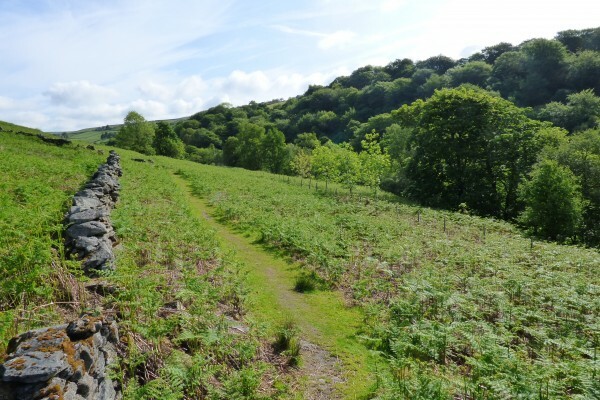 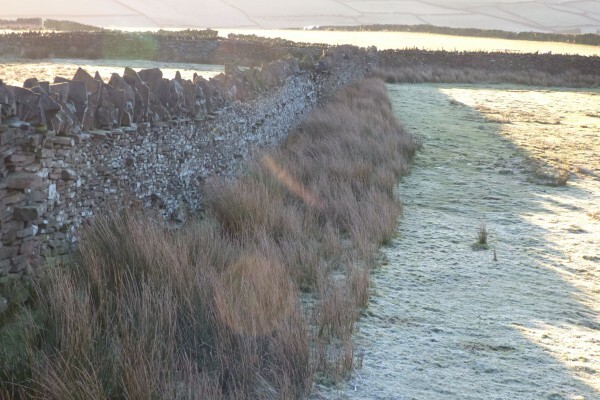 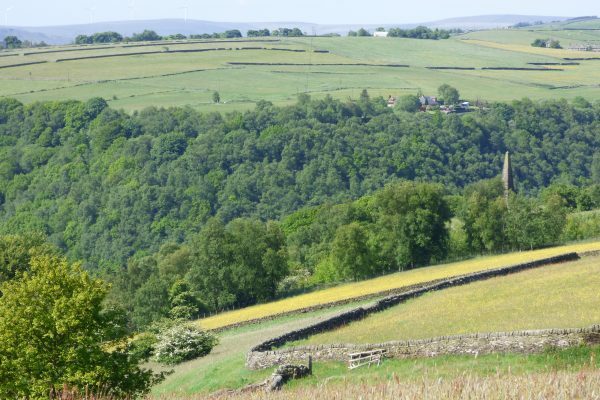 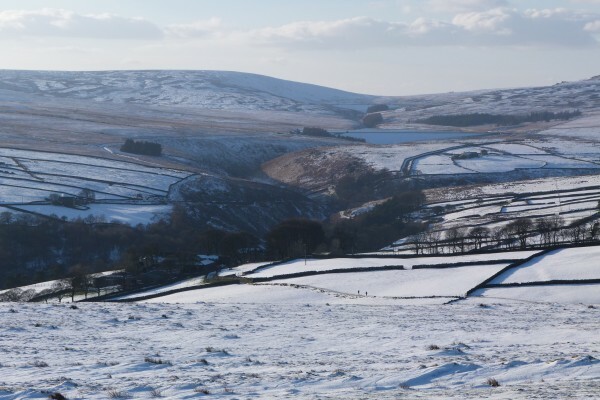 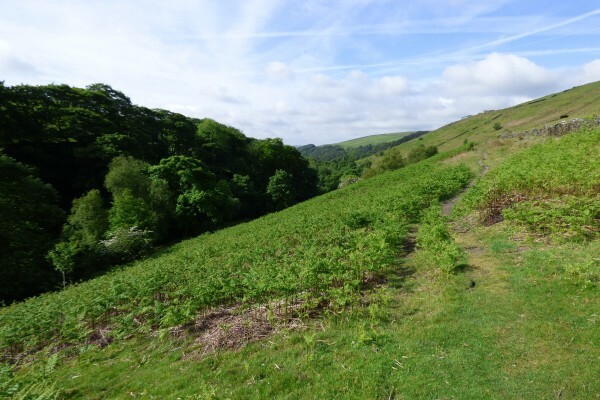 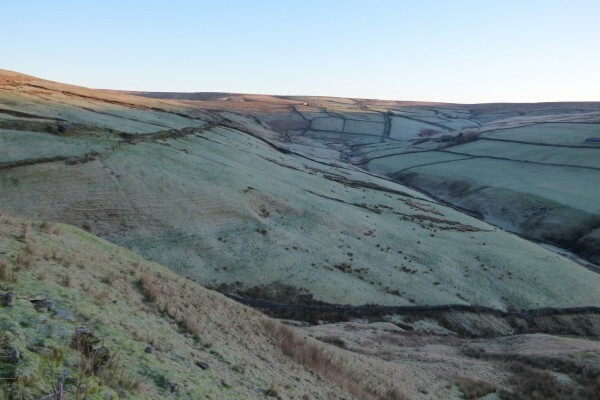 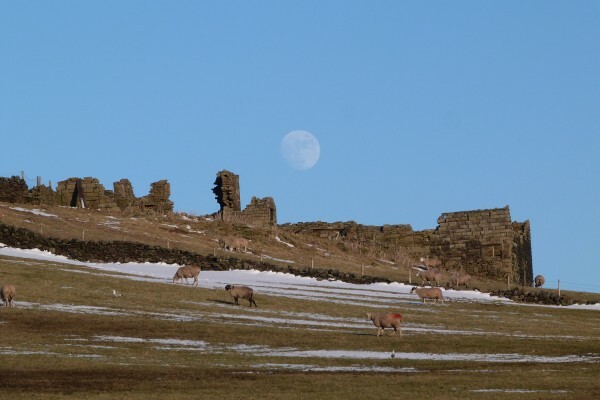 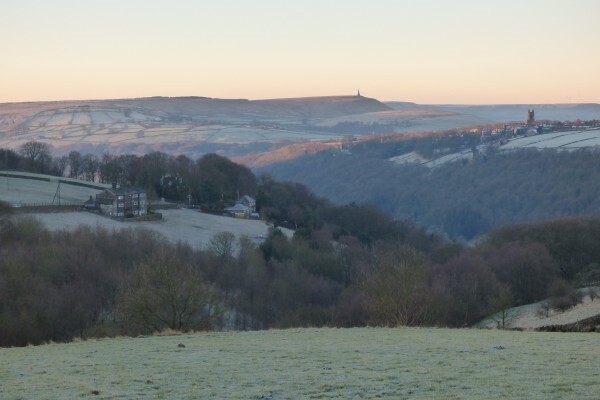 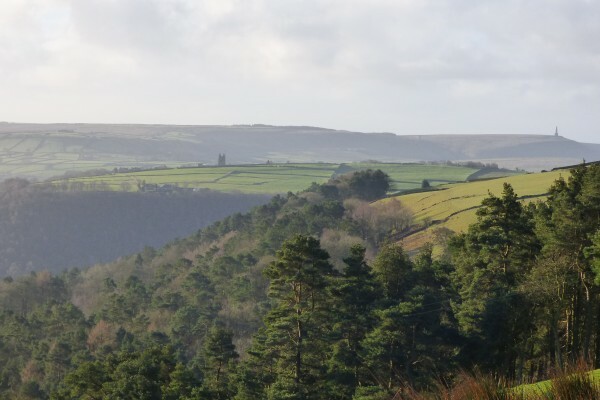 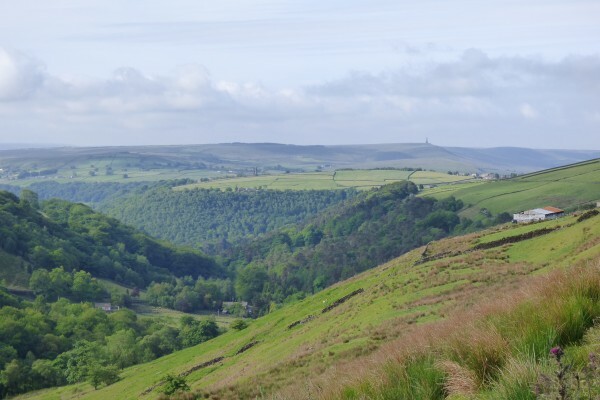 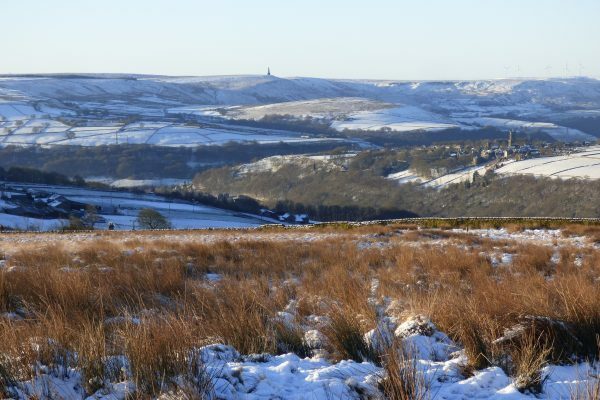 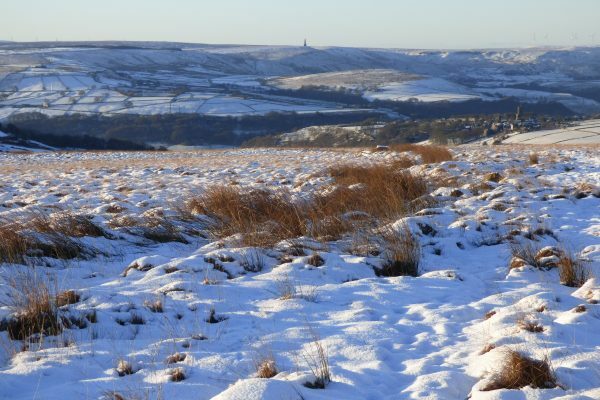 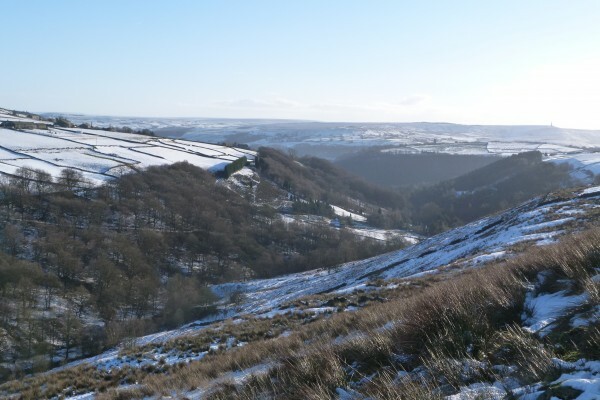 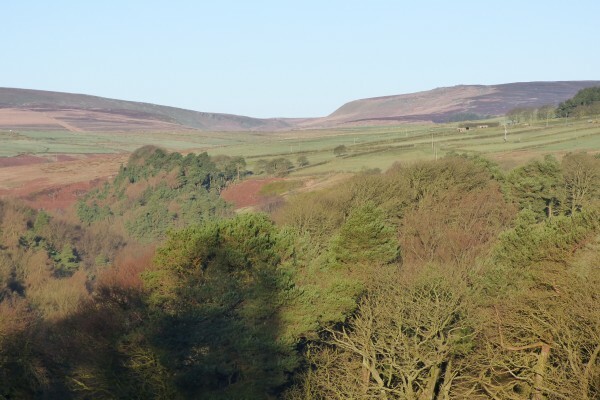 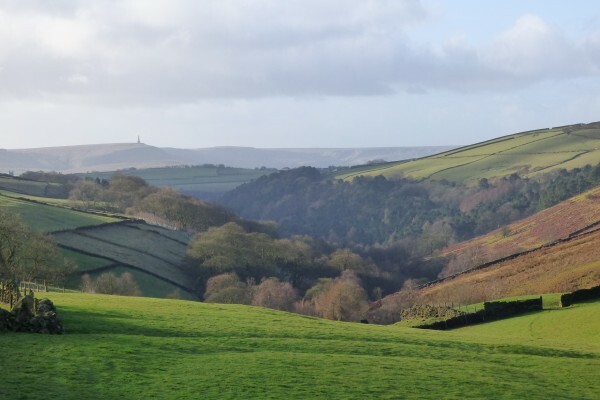 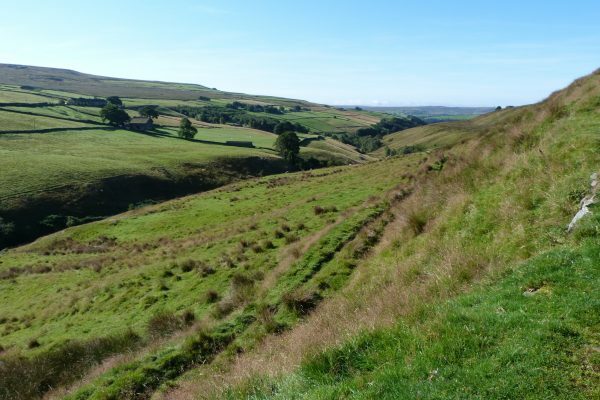 Crimsworth Dean is still a tranquil unspoilt valley with remarkable wildlife, but it’s also a place of great cultural significance whose unique atmosphere has captured the imagination of two major photographers – Fay Godwin and Martin Parr – and one of our greatest poets- Ted Hughes.